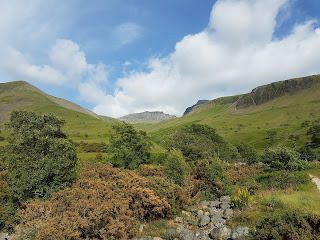 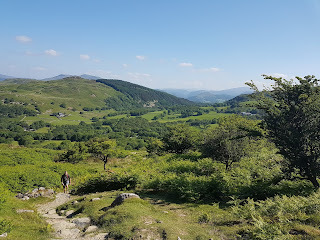 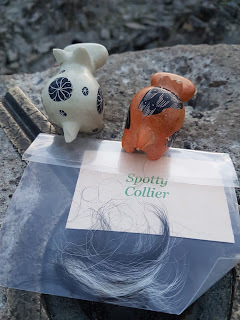 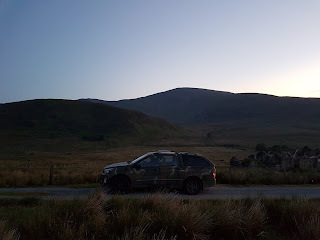 Be warned dear reader, this post is a bog one, as it needs to be to cover such a big adventure! 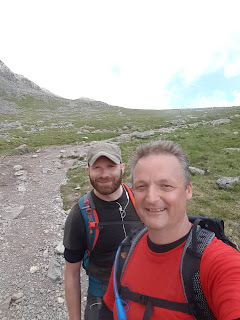 After months of planning (weeks then, ok a day) the 3x3 Peaks man test begins. 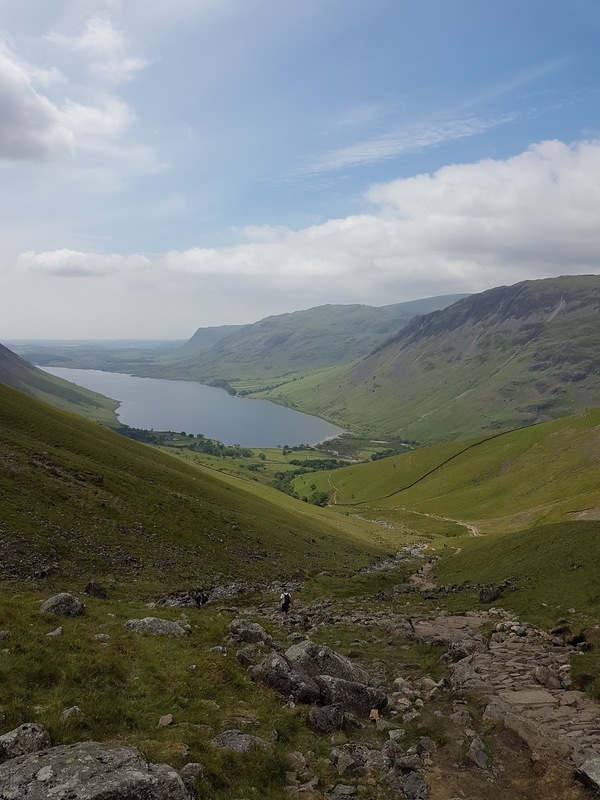 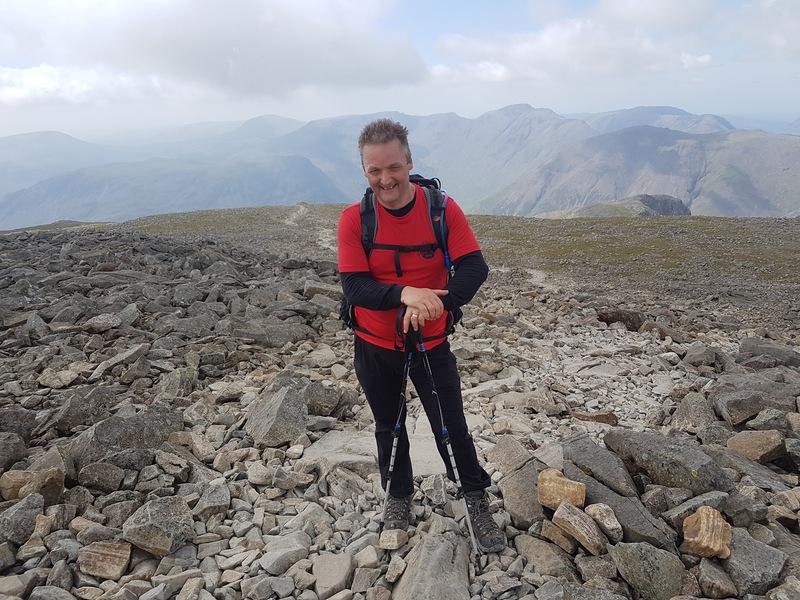 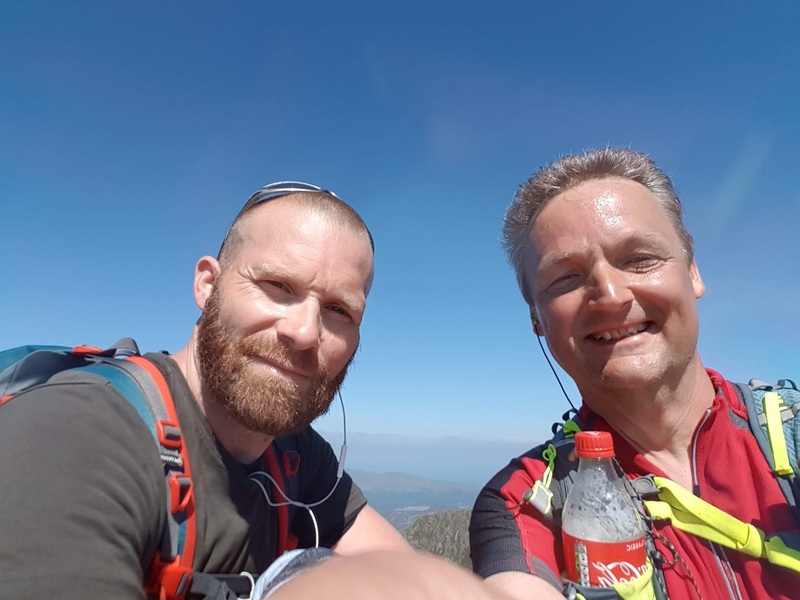 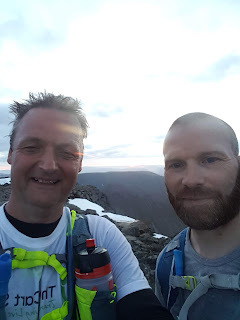 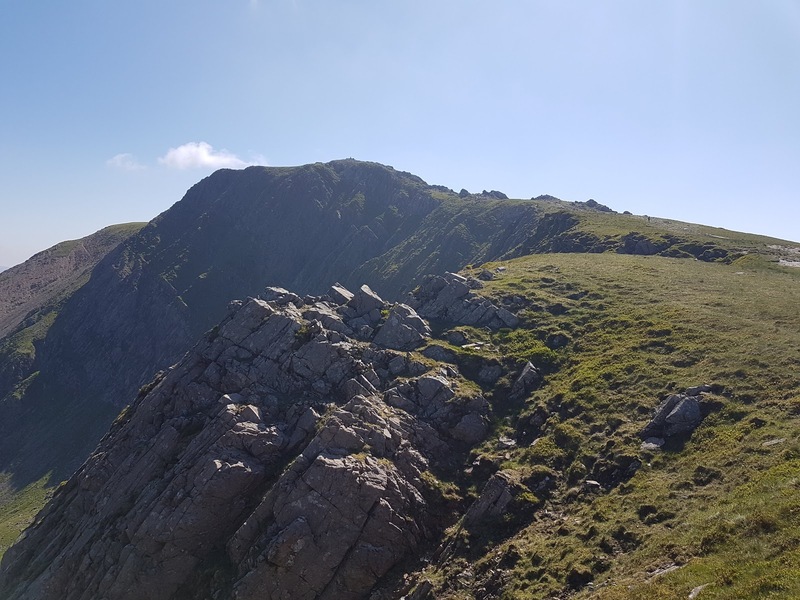 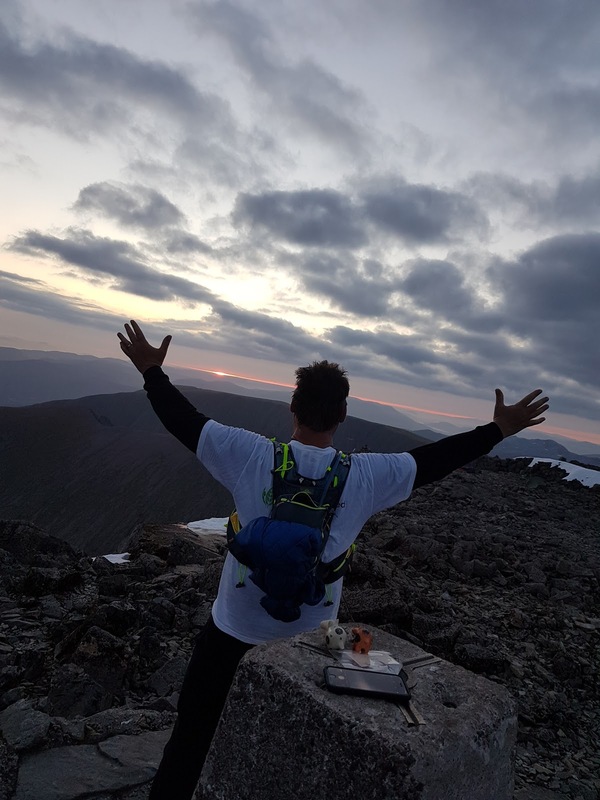 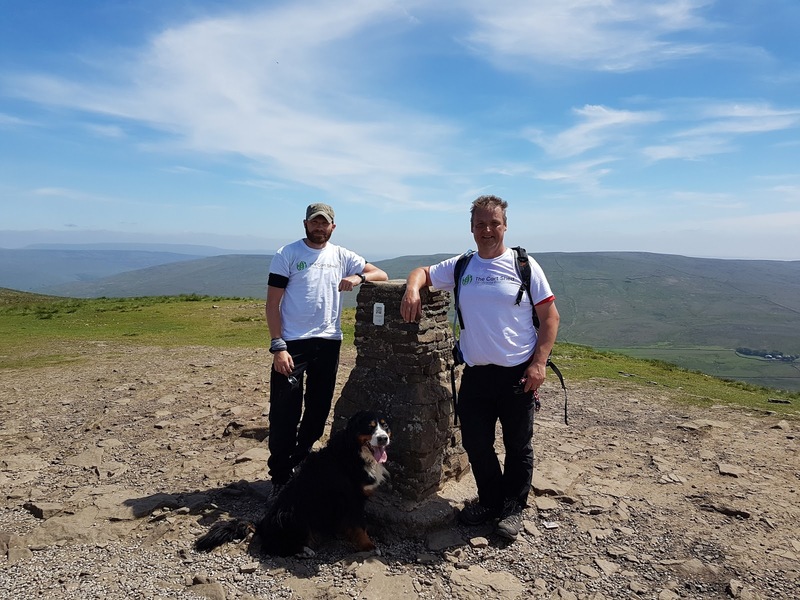 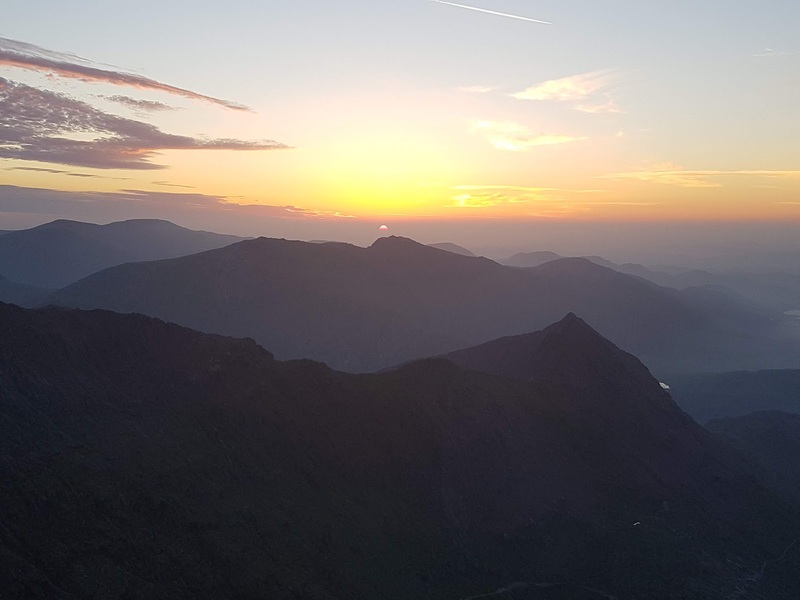 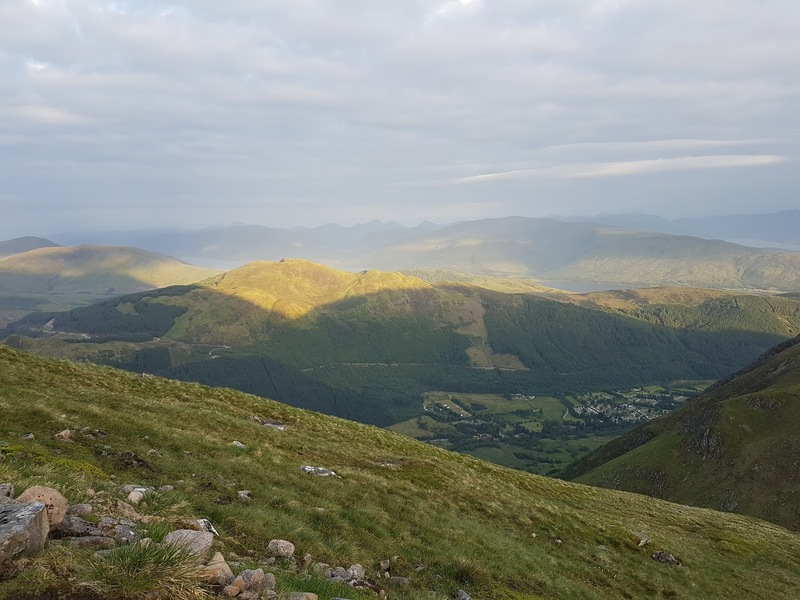 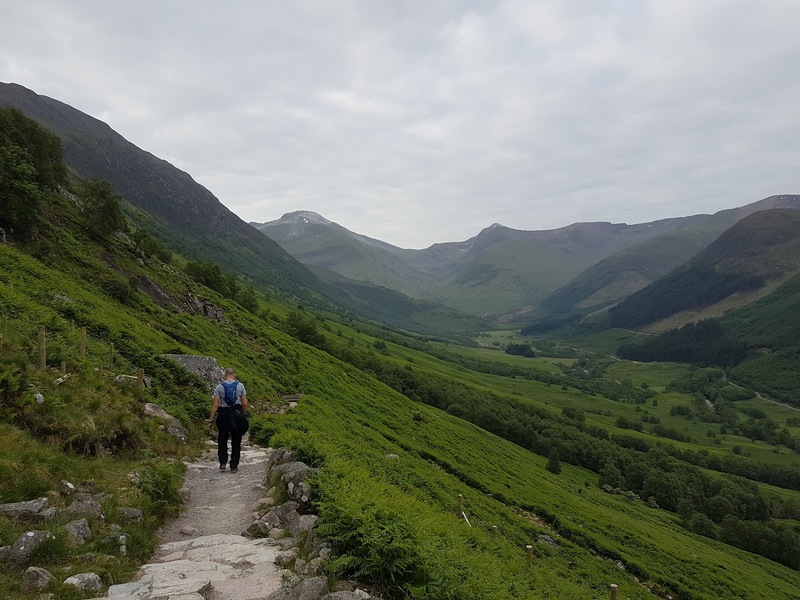 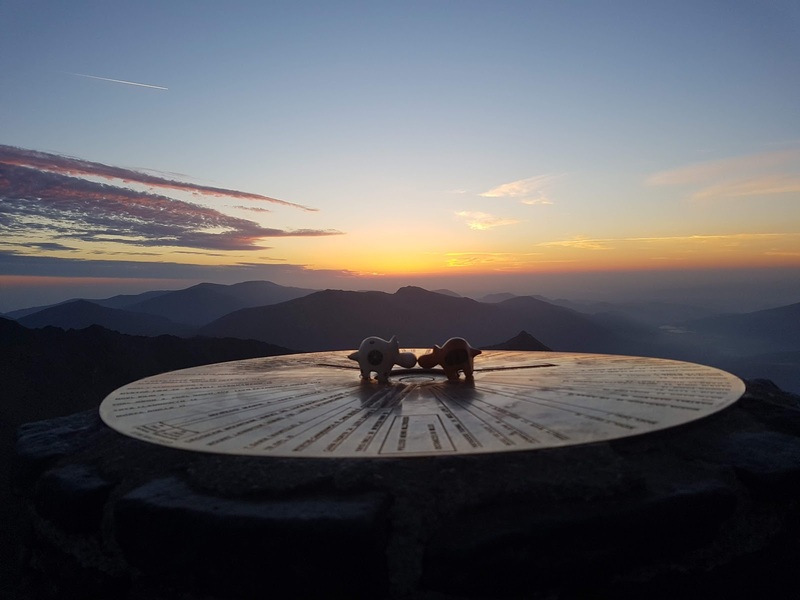 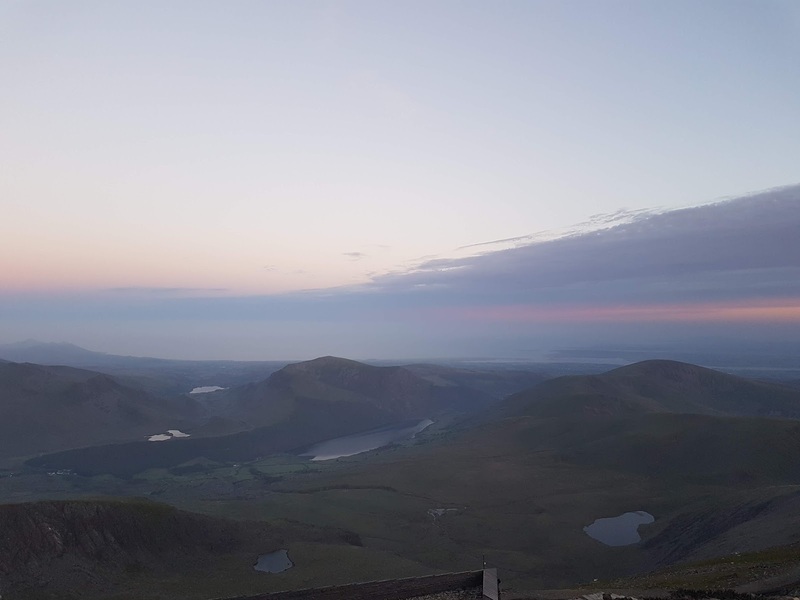 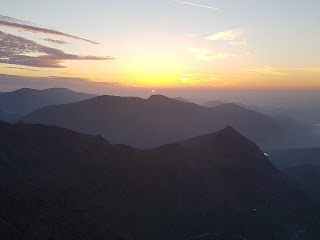 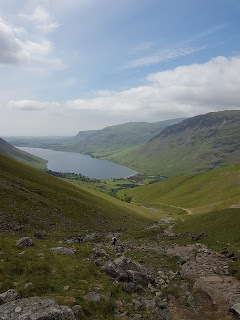 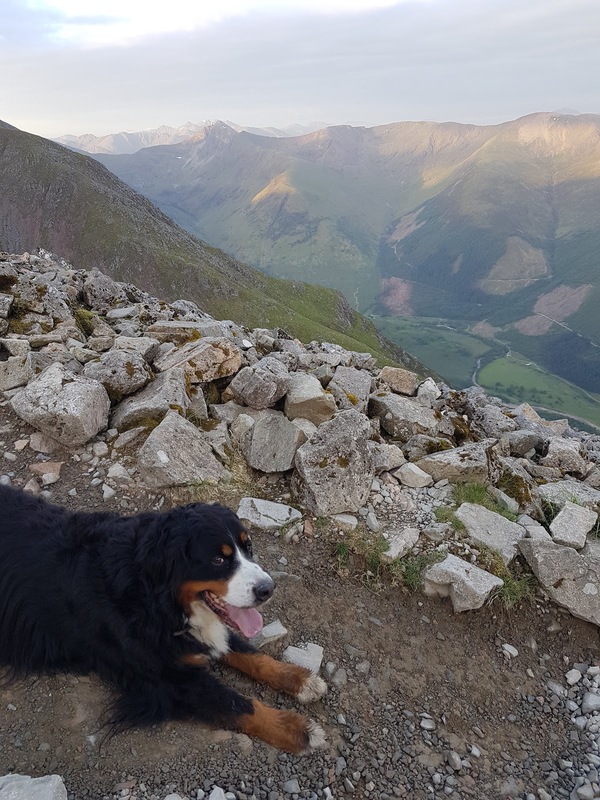 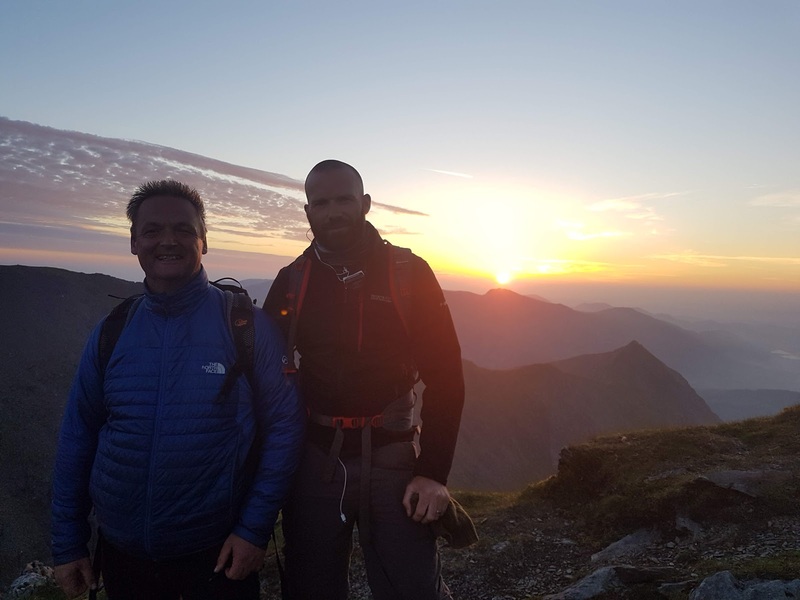 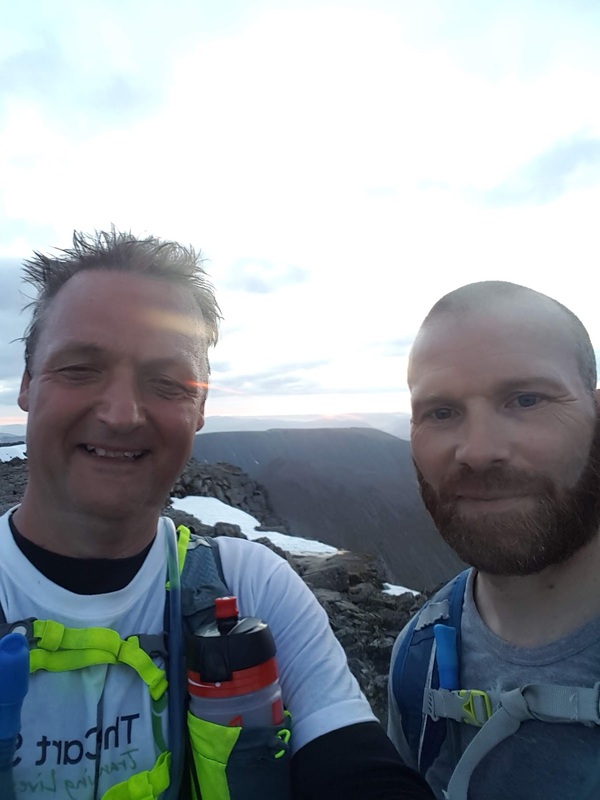 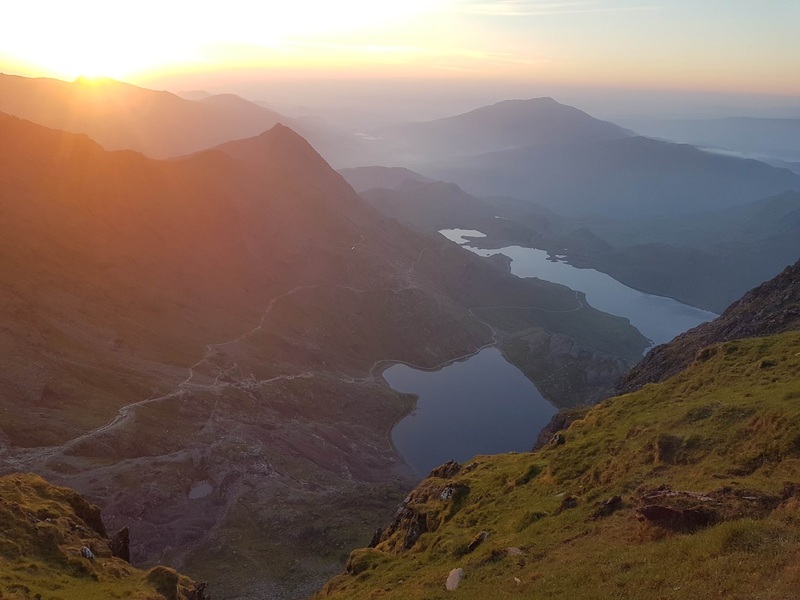 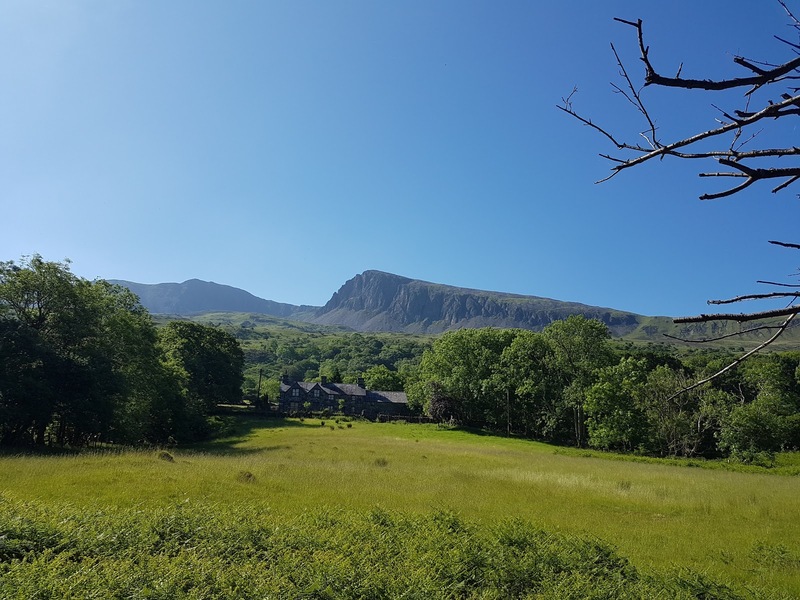 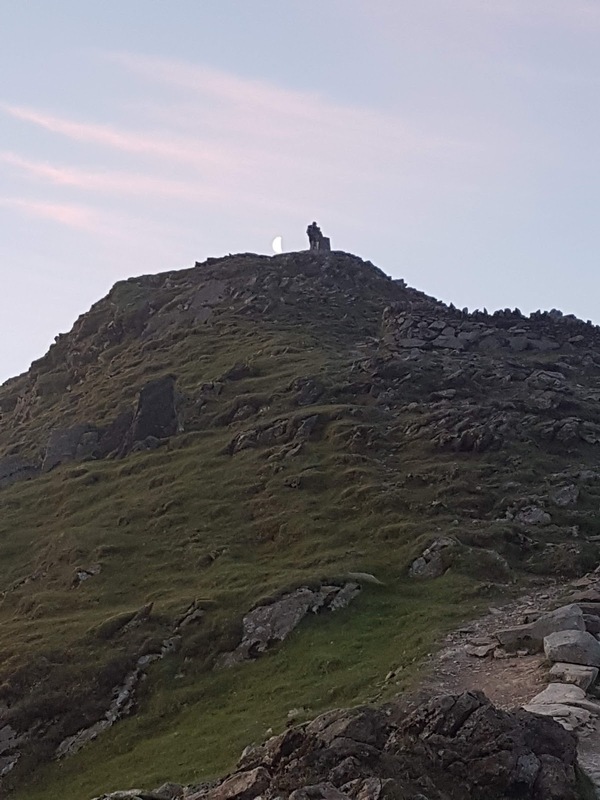 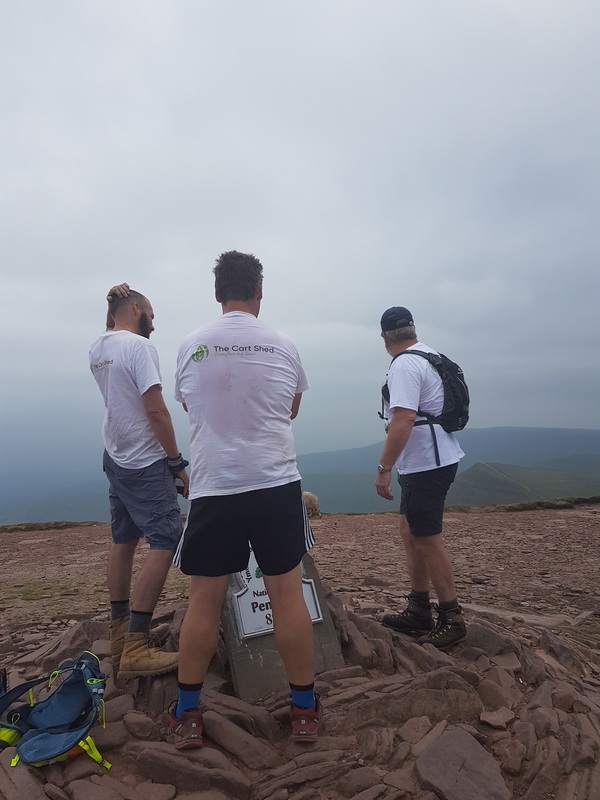 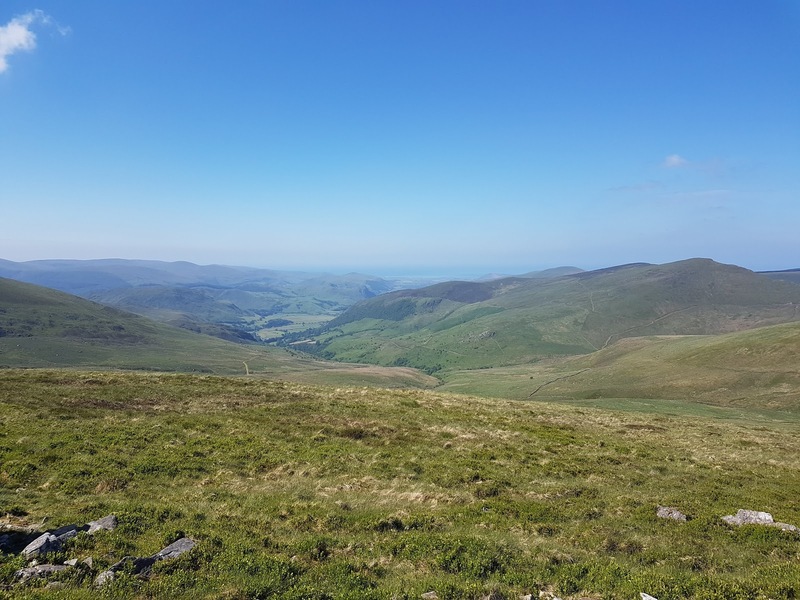 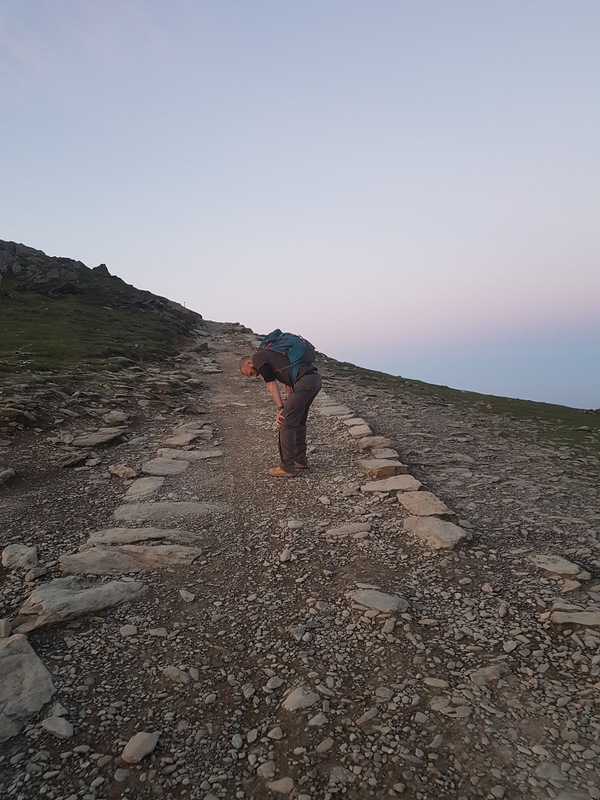 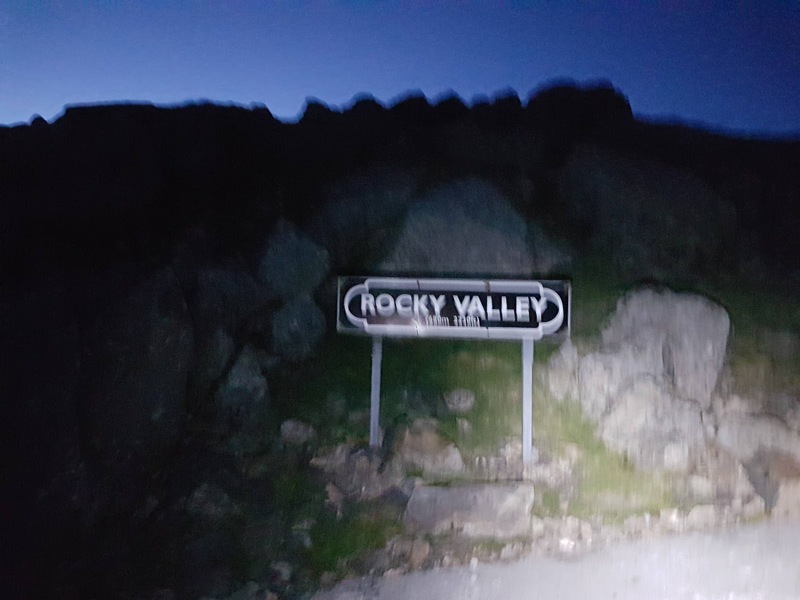 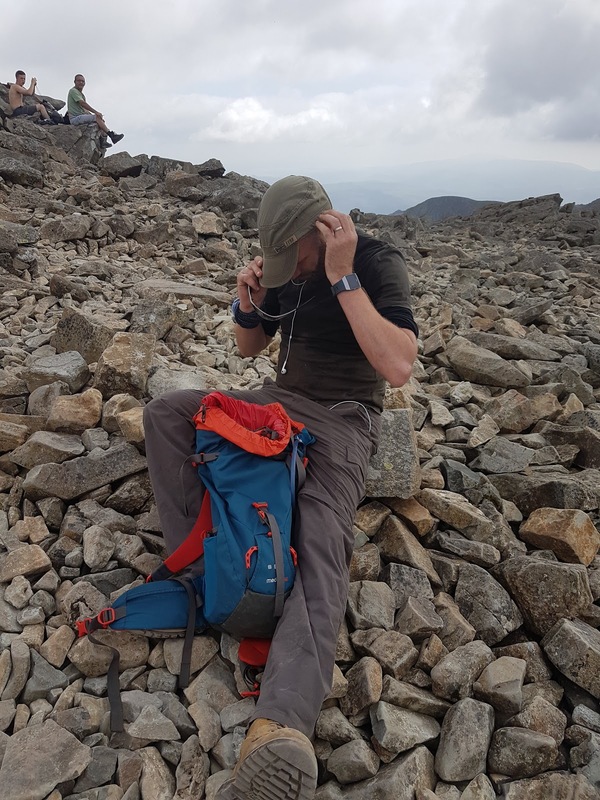 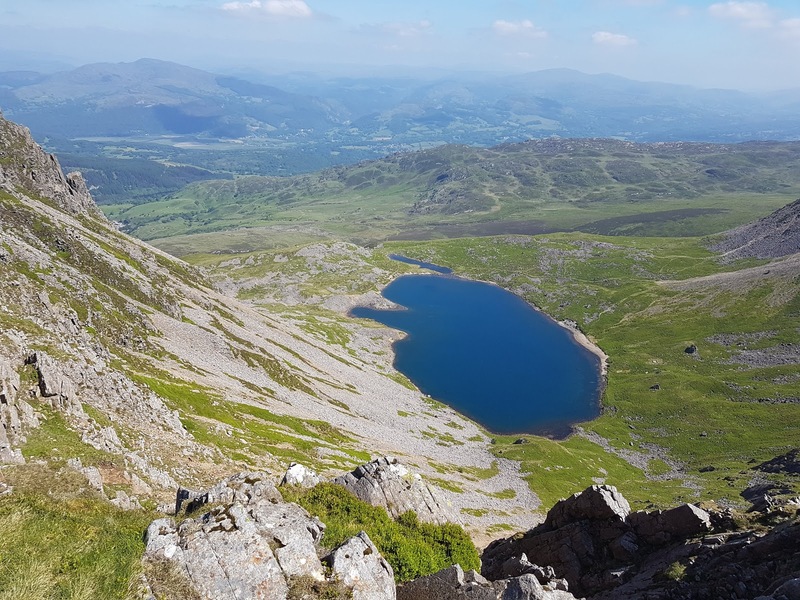 However, as a colleague had recently died we decided that our attempt to set a record time for the never been done before back to back 3 Peaks Challenge should be in his memory and hopefully raise some money to prevent future suicides in young men. 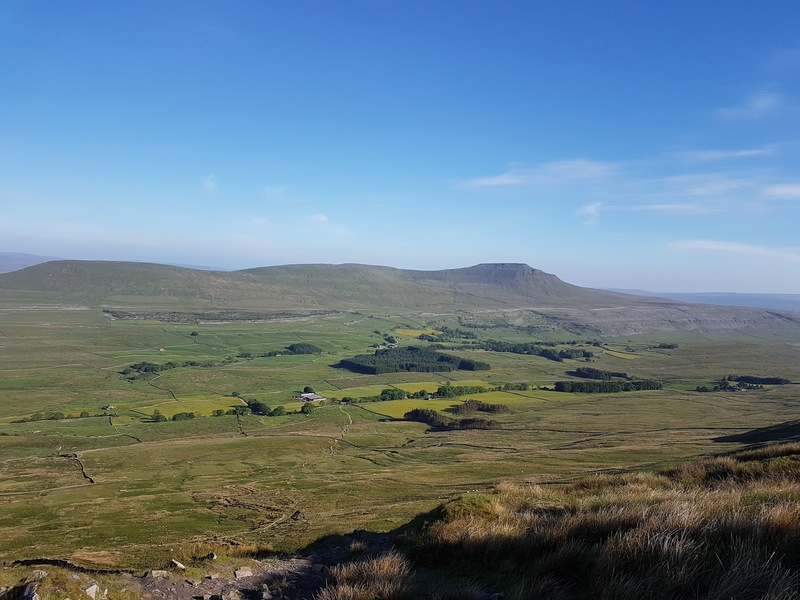 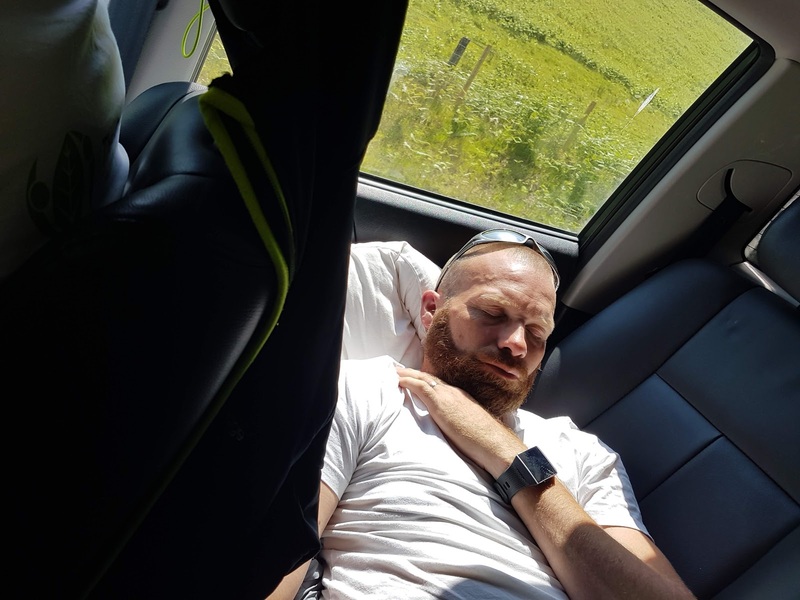 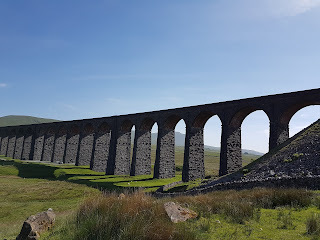 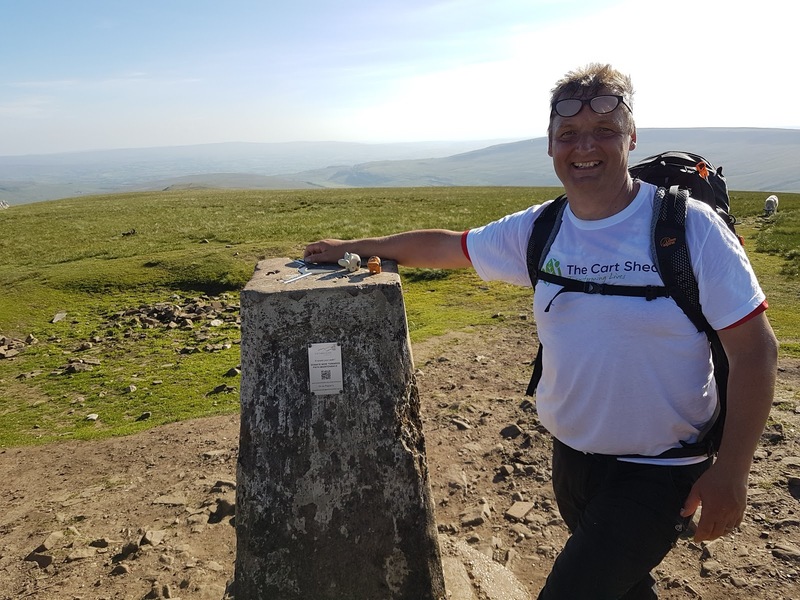 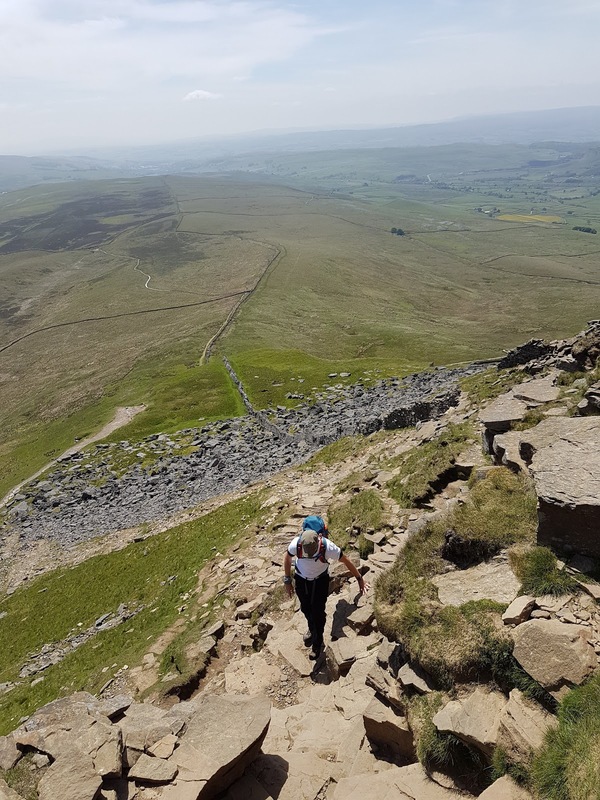 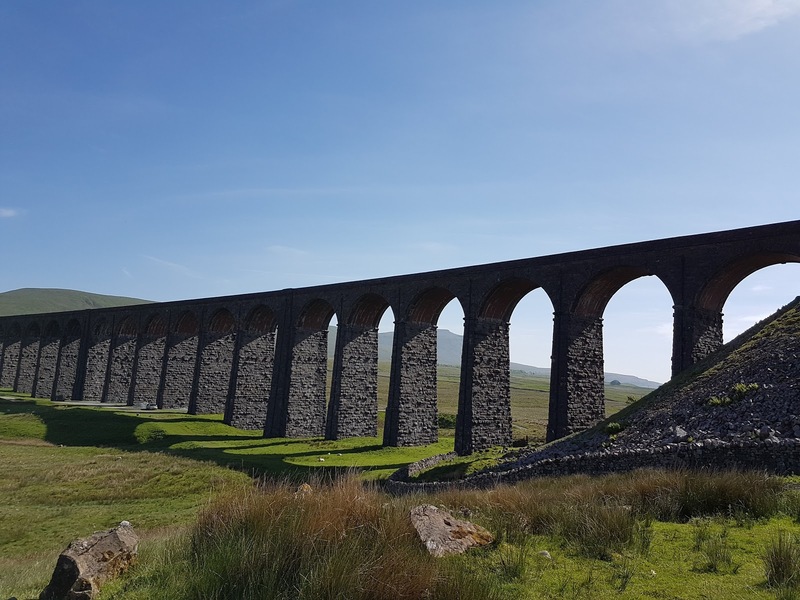 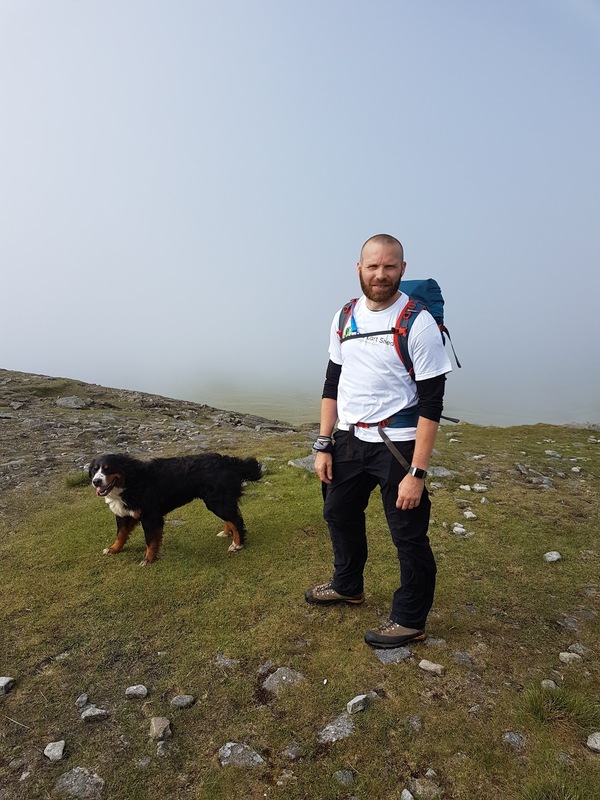 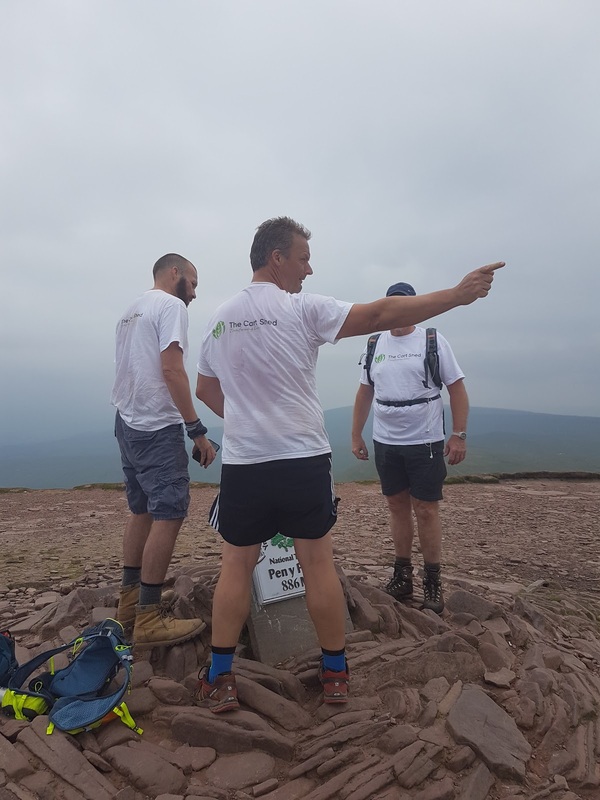 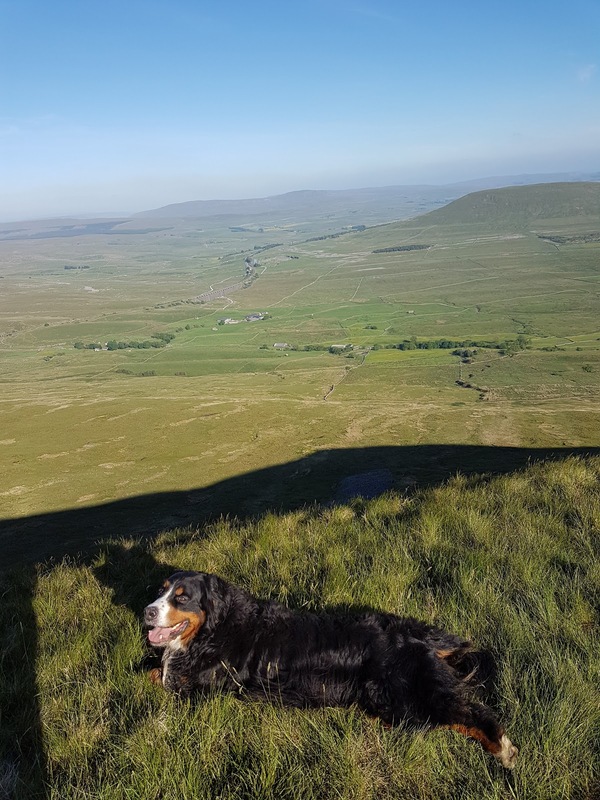 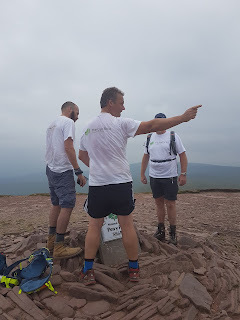 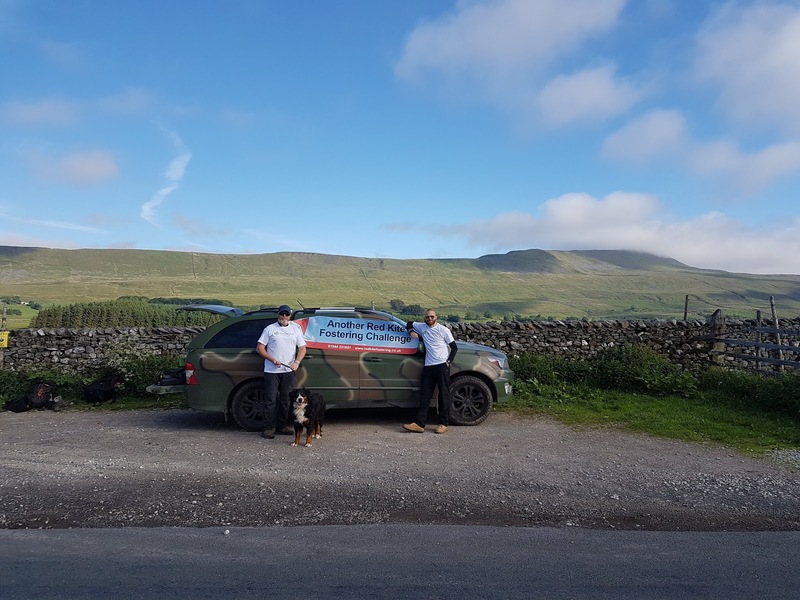 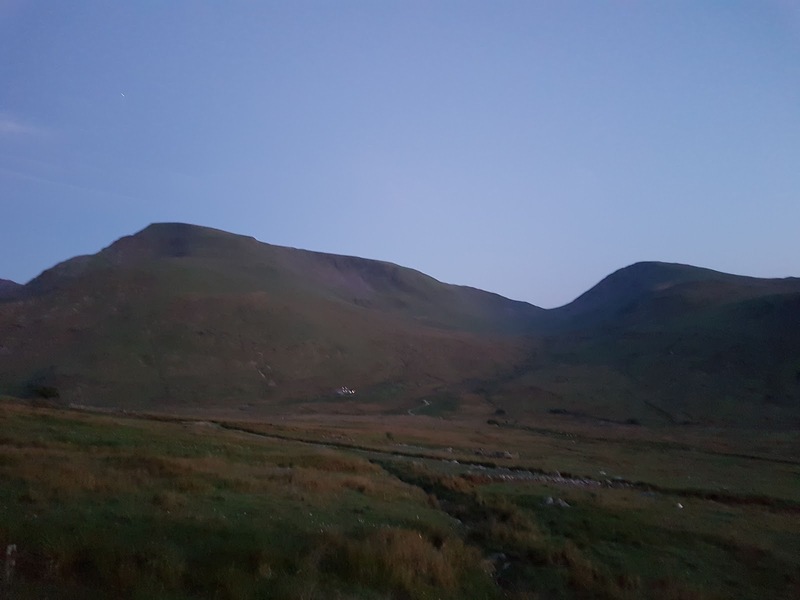 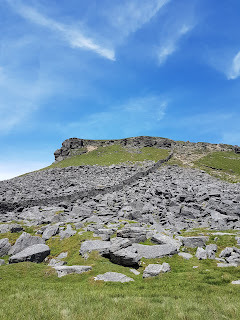 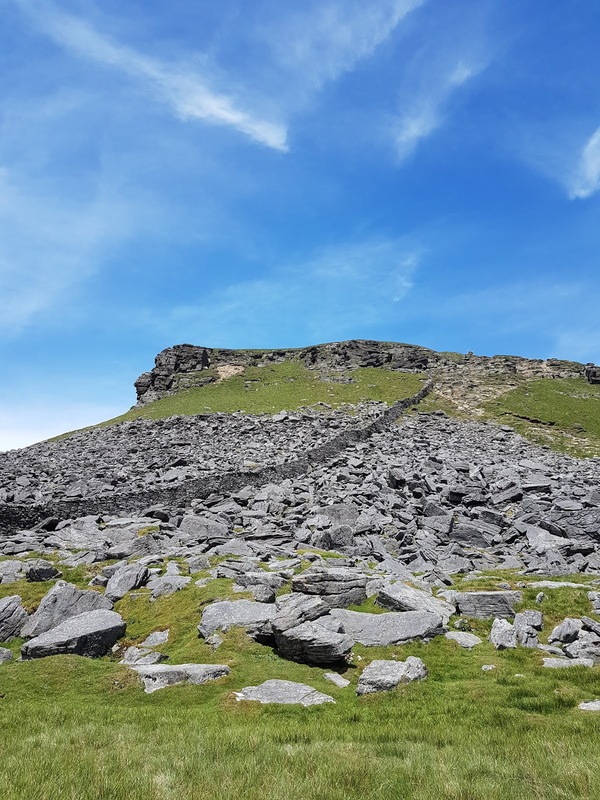 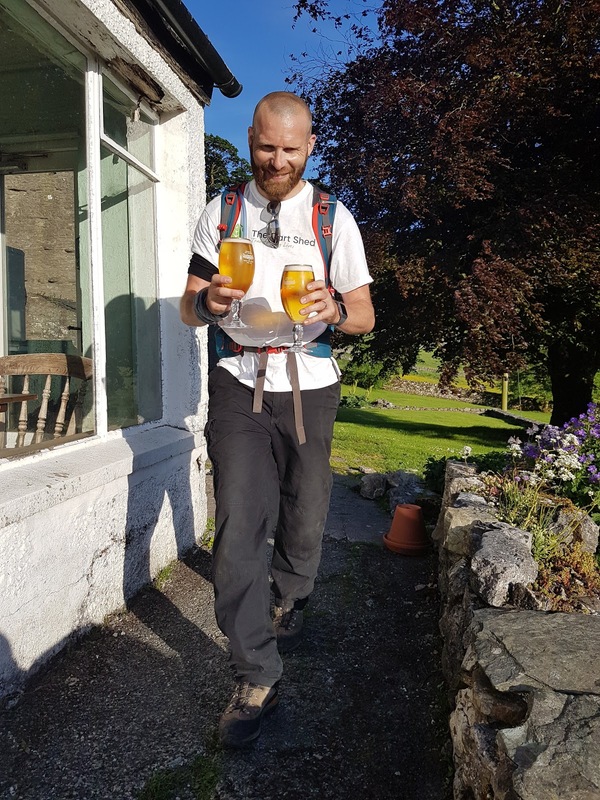 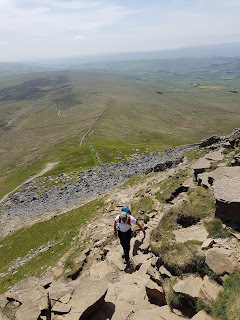 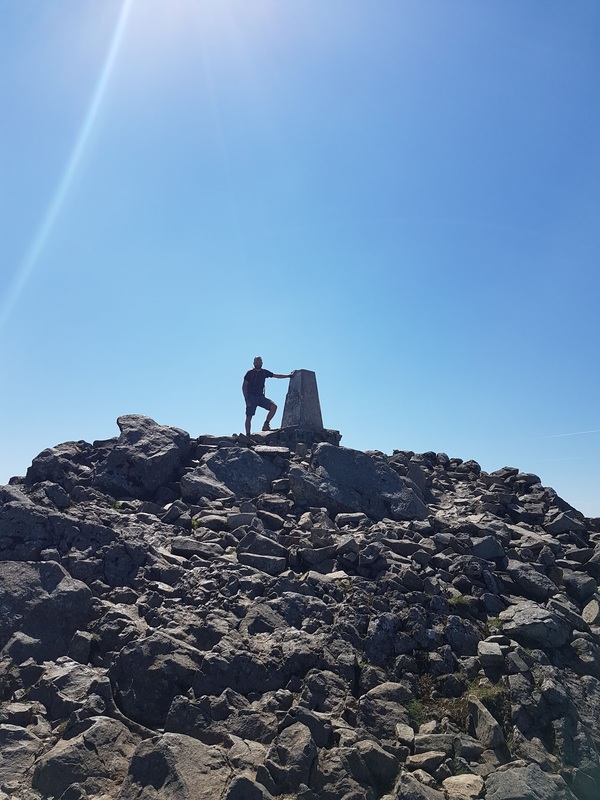 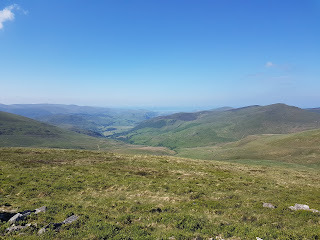 So the Adam Hodges Memorial 3x3 Peaks challenge is a simple one, to complete the Yorkshire 3 peaks, The National 3 Peaks and the Welsh 3 Peaks as fast as possible and in any case under the 72 hours time limit. 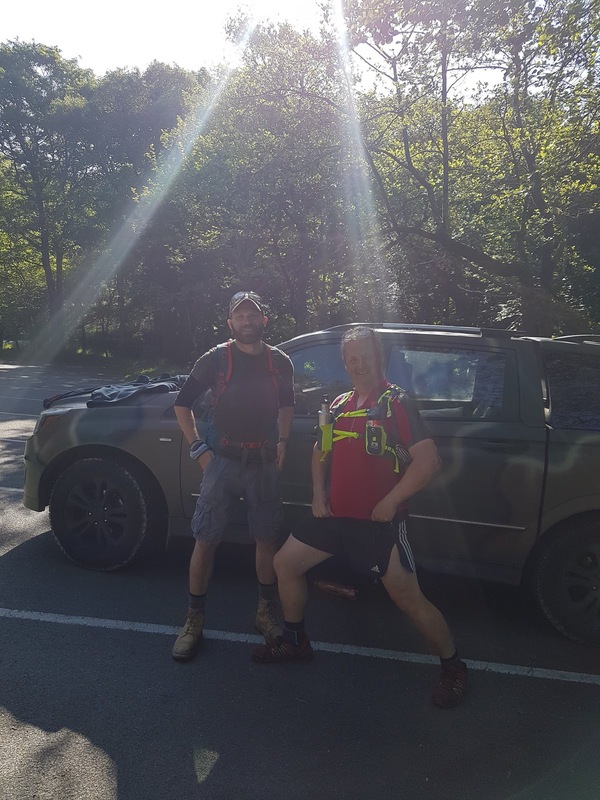 This will entail 12oo miles of driving, 9 mountain climbs, 64 miles of hiking/running and a combined climb of 7893 metres. 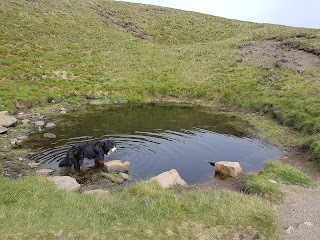 What could possibly go wrong, well by the look on Mrs Bear's face, quite a lot! 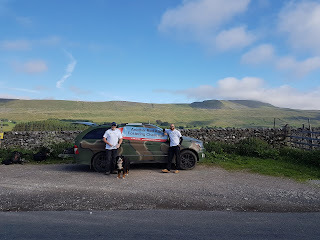 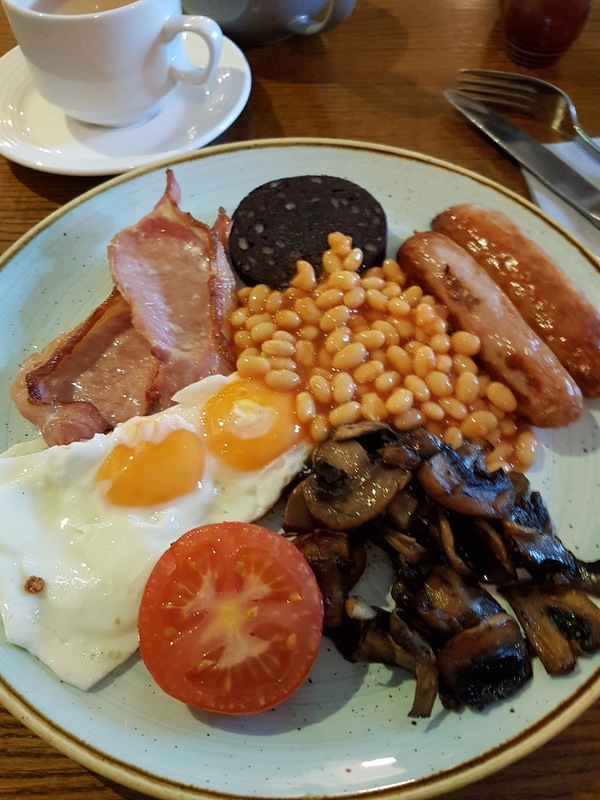 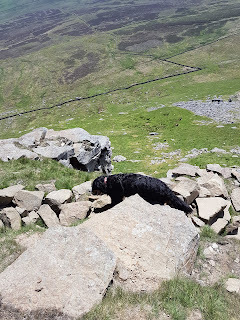 So after a stupidoclock start from Red Kite HQ with Mrs Bear, Keeef and Richard we find ourselves at the start of the Yorkshire 3 Peaks, opting for the Old Hill Inn start point as opposed to the usual Horton village end. 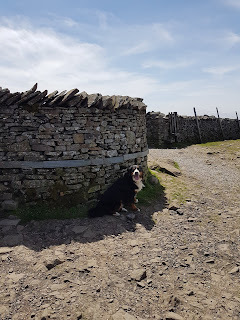 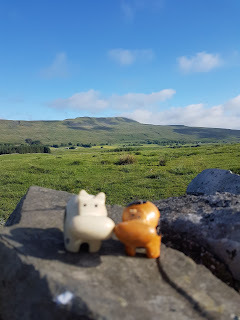 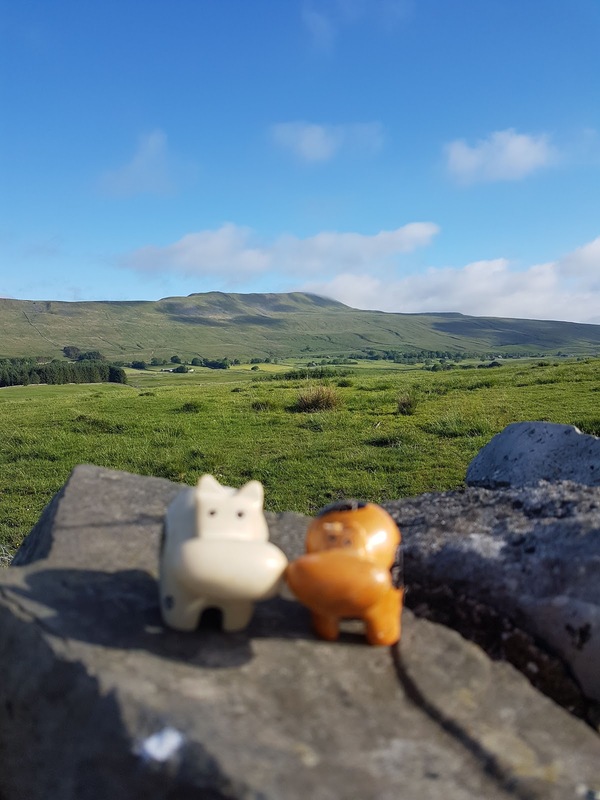 We posed for pics while mascots Eric and Ernie lazed about on the stone wall with Whernside looming in the background. 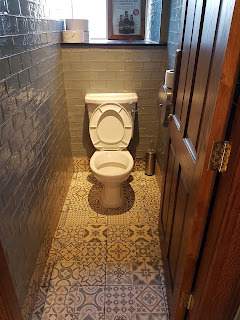 that was so welcoming. 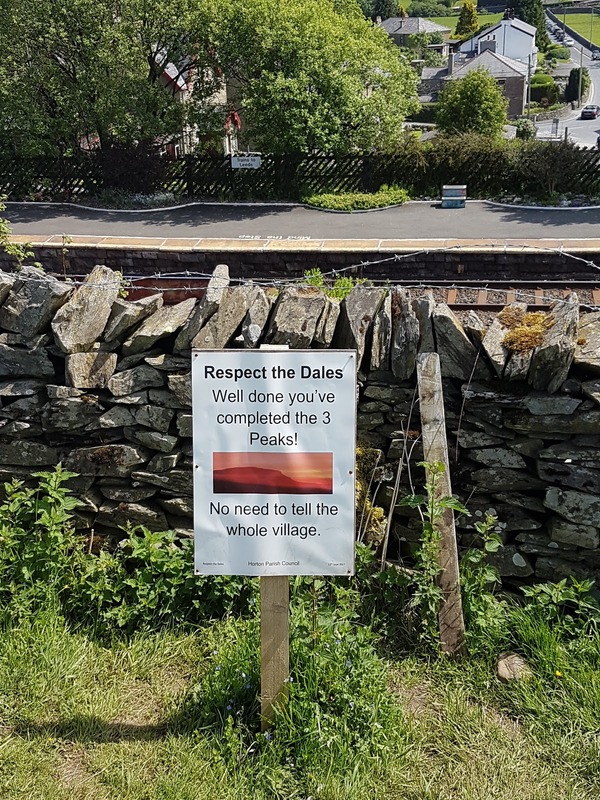 In fact the whole Dales seemed less that enamoured to walkers by the signage and closed cafes. 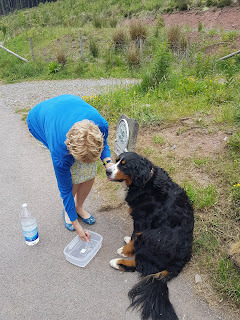 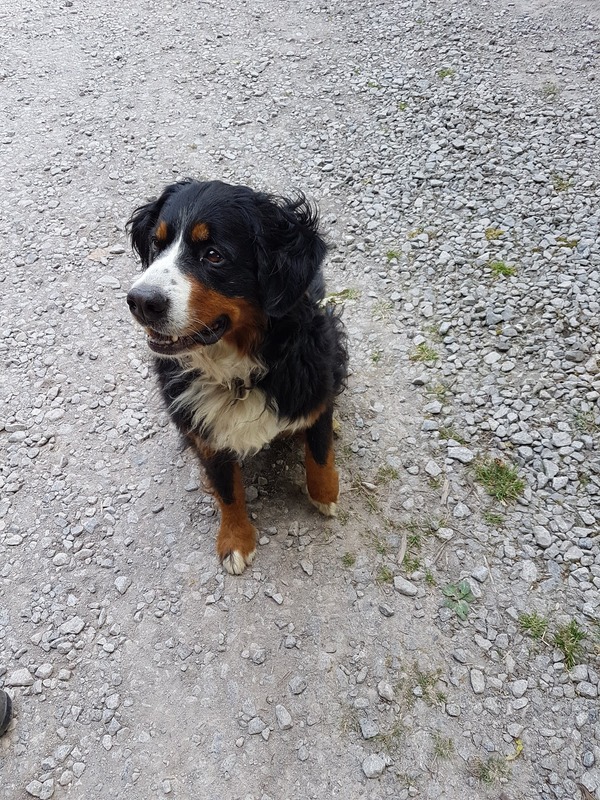 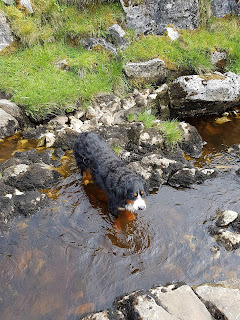 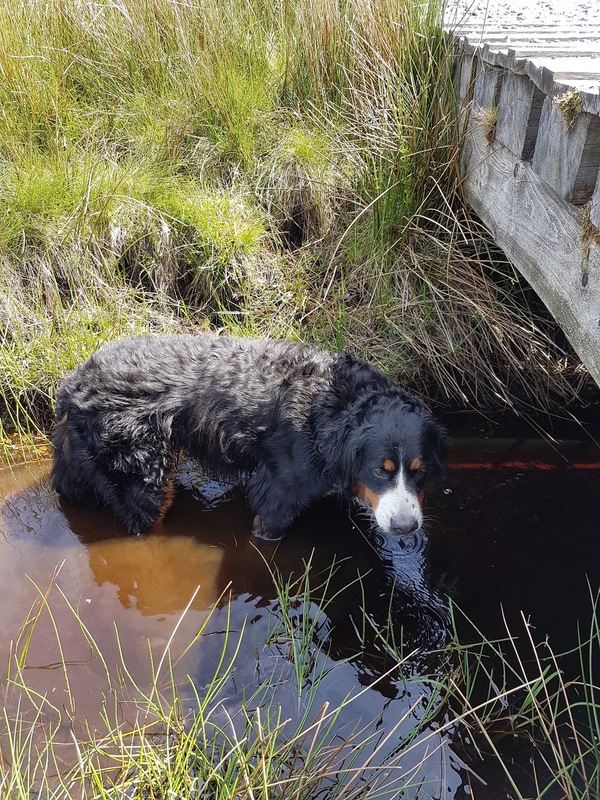 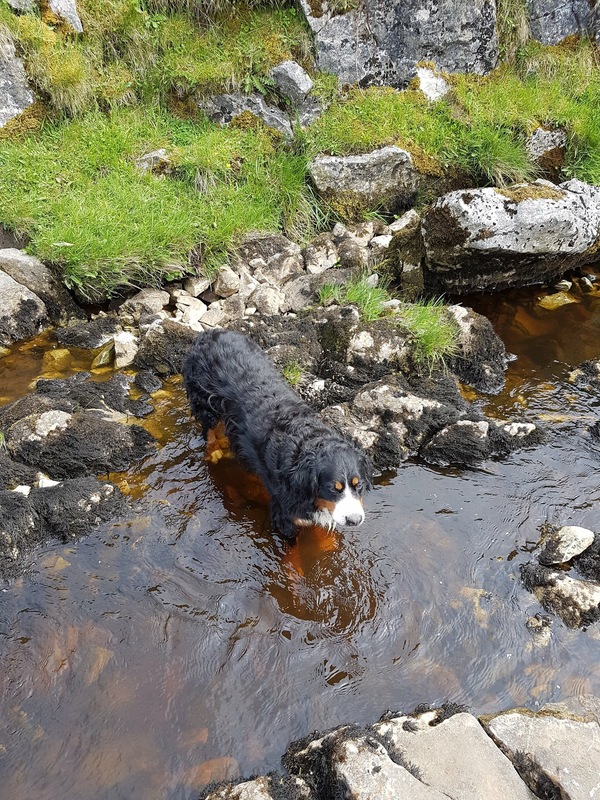 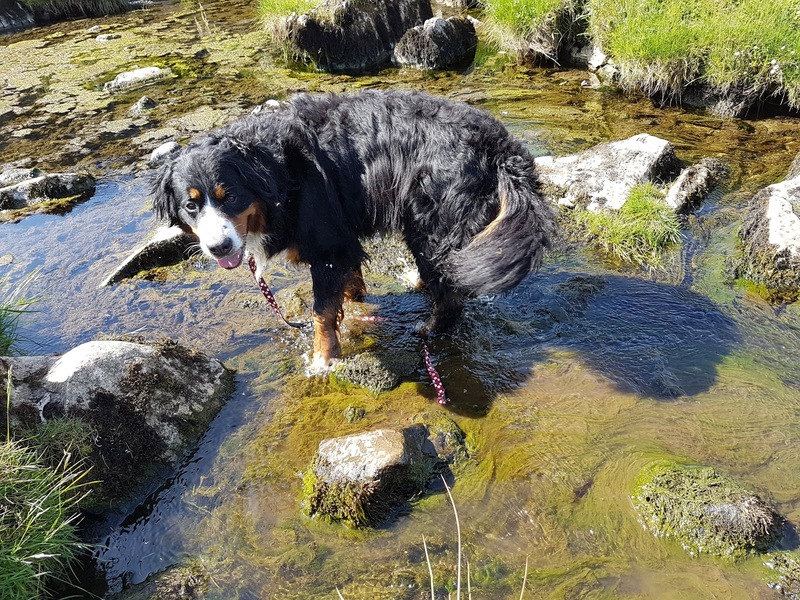 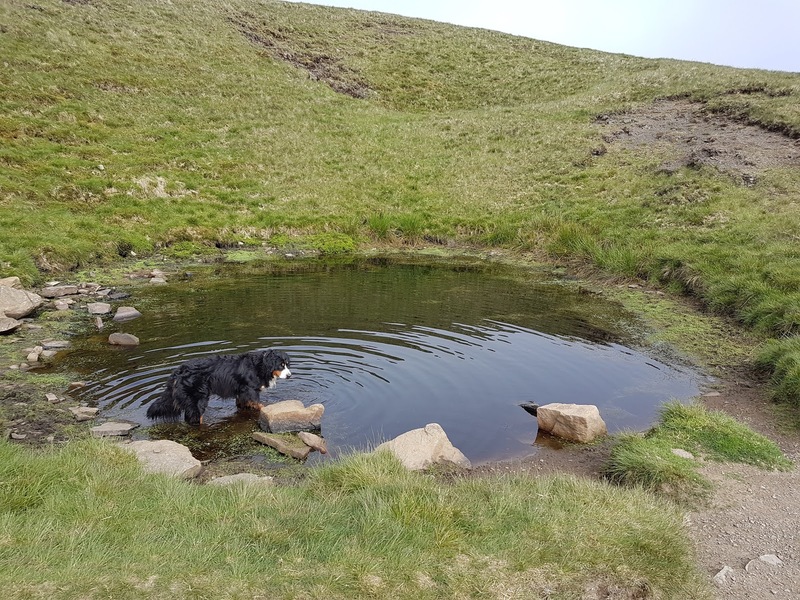 made sure she was hydrated by giving her the contents of my water bladder, as afterall we would soon be back in civilisation and able to re stock. 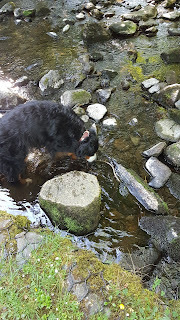 stayed in the cool water until she stopped panting. pretty soon we were on the final summit looking down on the car. 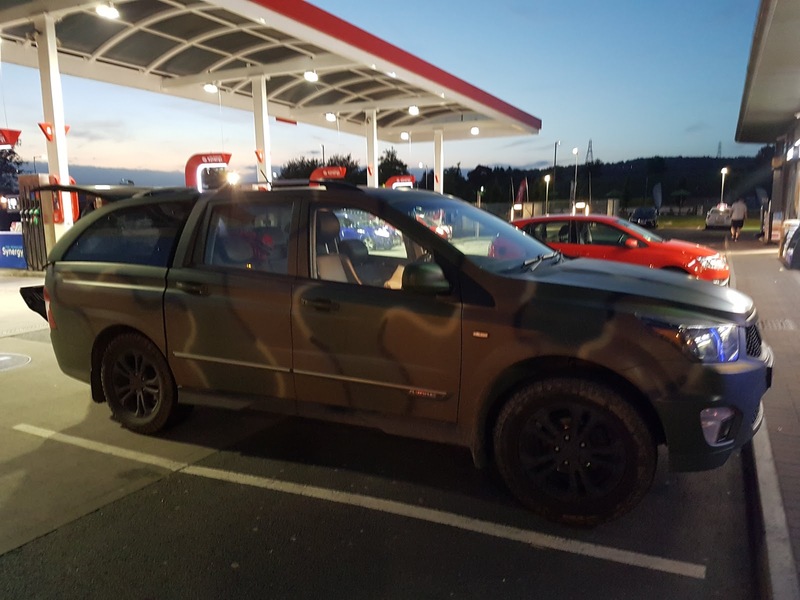 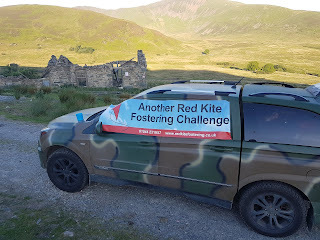 to Keef and our support vehicle Stan. 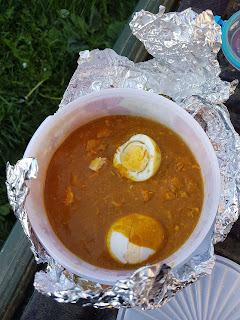 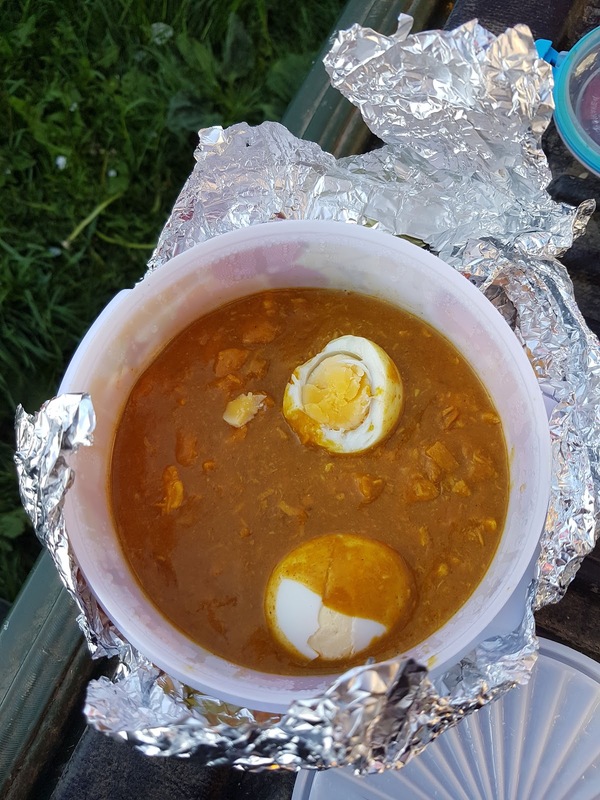 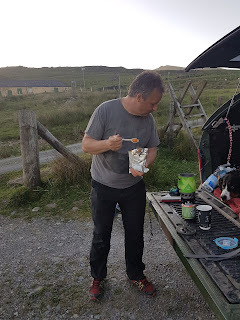 Quite why Keef thought that curried eggs were suitable fayre for three men and a dog trapped in a metal box for hours is a side issue. 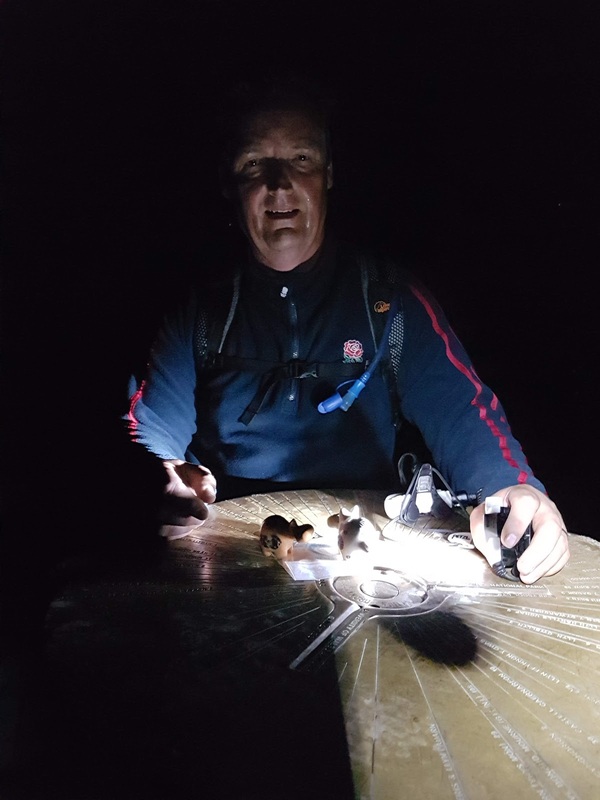 Richard and yours truly tried to sleep while Keep pointed Stan in the direction of Ben Nevis. 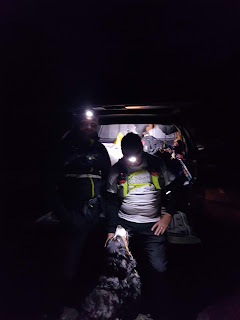 1.50 am base of Ben Nevis and properly tooled up we set off to bag our 4th summit . 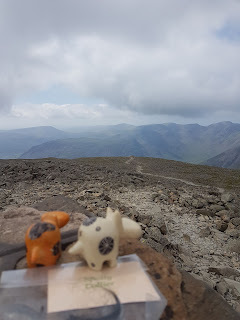 Mrs Bear gave all indications she was as keen as we were and this time we knew it would be cooler and lots to drink along the way. She took full advantage of this but we noticed she was not drinking just putting her paws in. 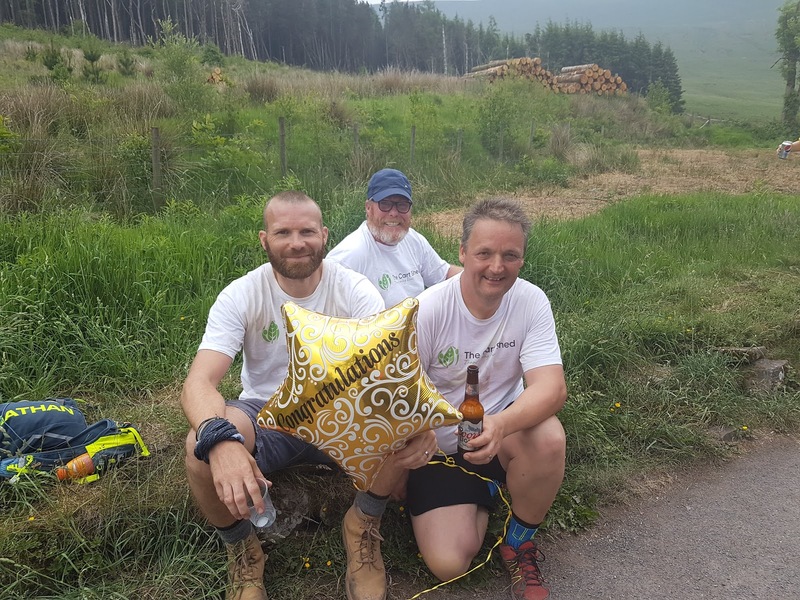 the sweat on Richard showing how much effort he has put into this. 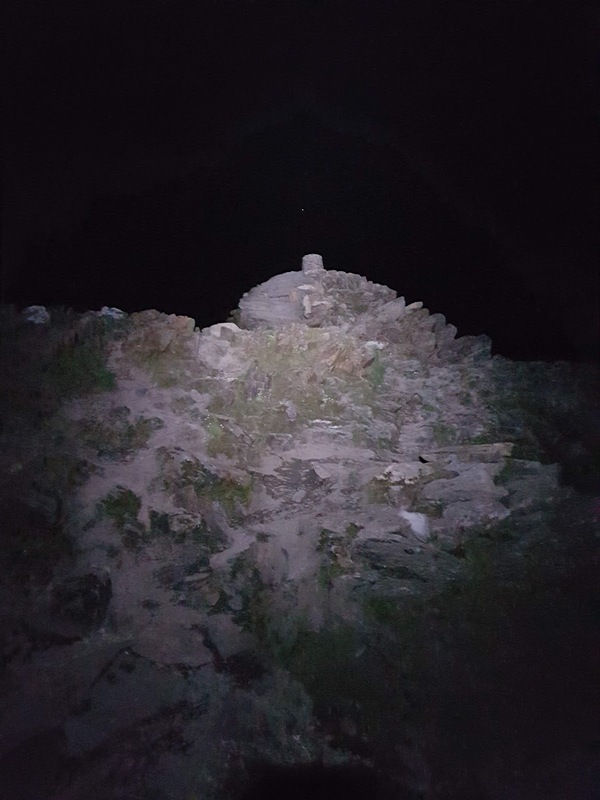 Summit cornice still there above the gully, a 500 metre dead drop just steps away. 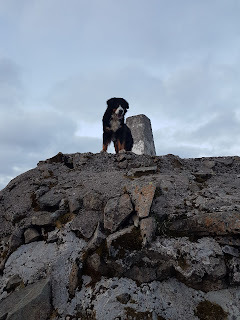 Eric and Ernie on the summit trig point and Spotty, regular readers will know who he is. which is when Mrs Bear got into difficulty again having cut her paws. 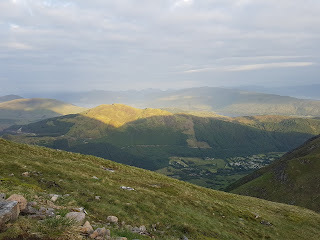 The shadow of Ben Nevis on the glen. 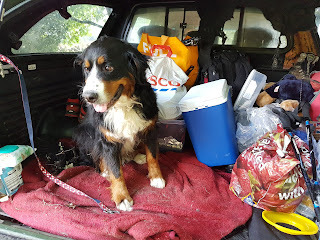 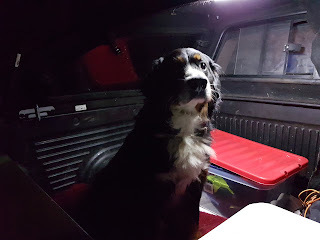 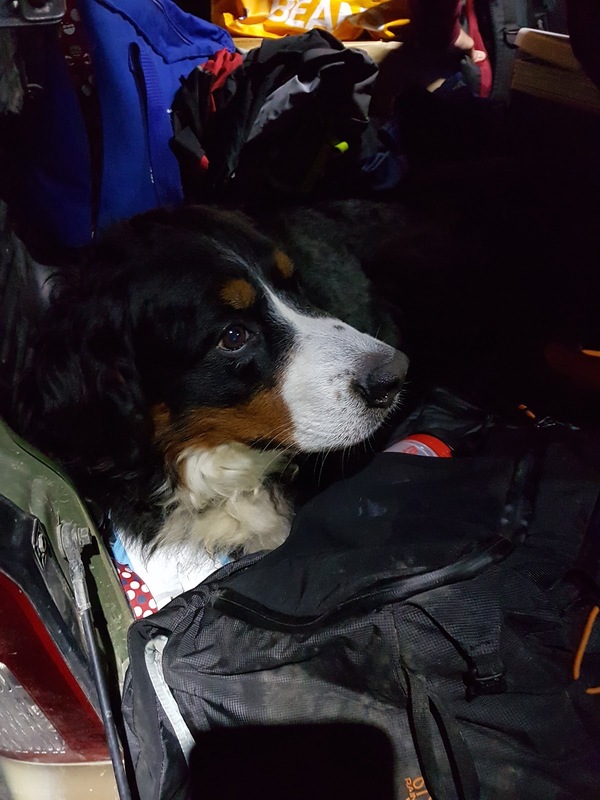 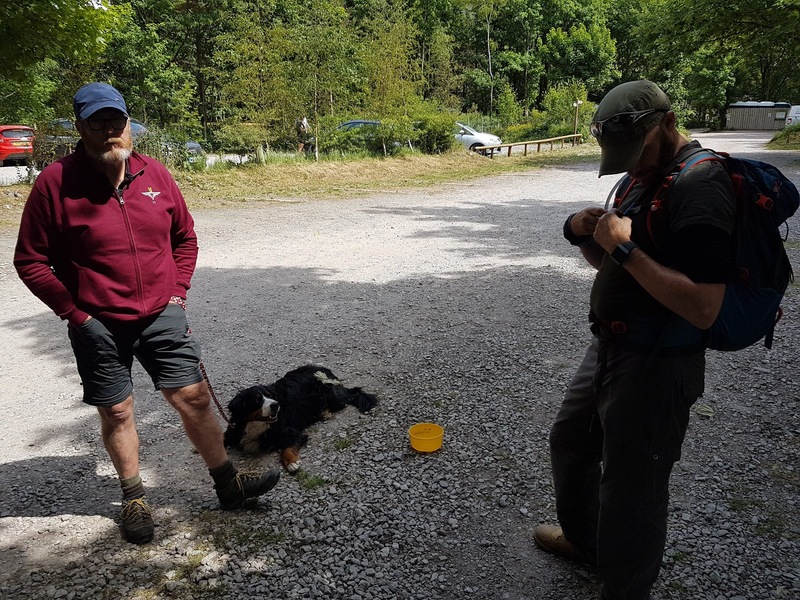 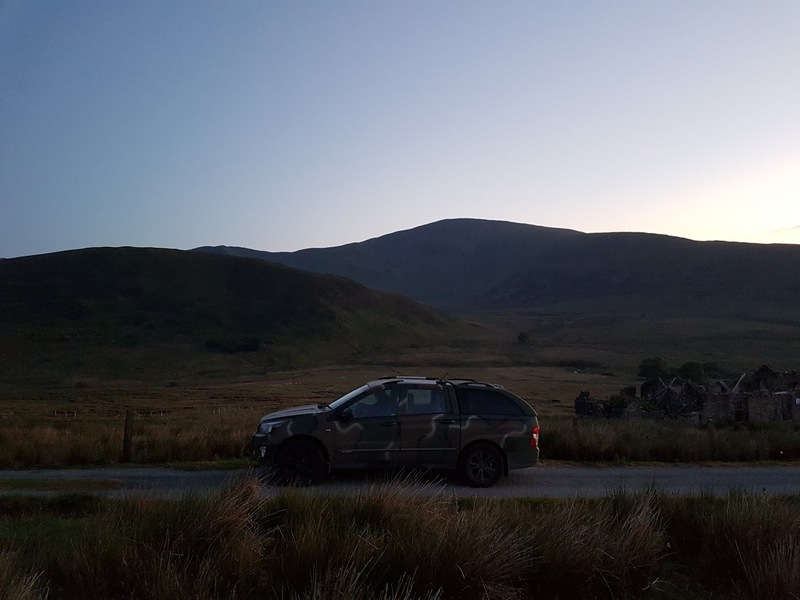 We made it down to the YHA car park and waiting for us was Keef, Stan, bacon and egg sandwiches and around 1.3 trillion midges all set on sampling bits of me. So we hastily packed up and headed south it still being less than 23 hours into the challenge. Confidence was high. 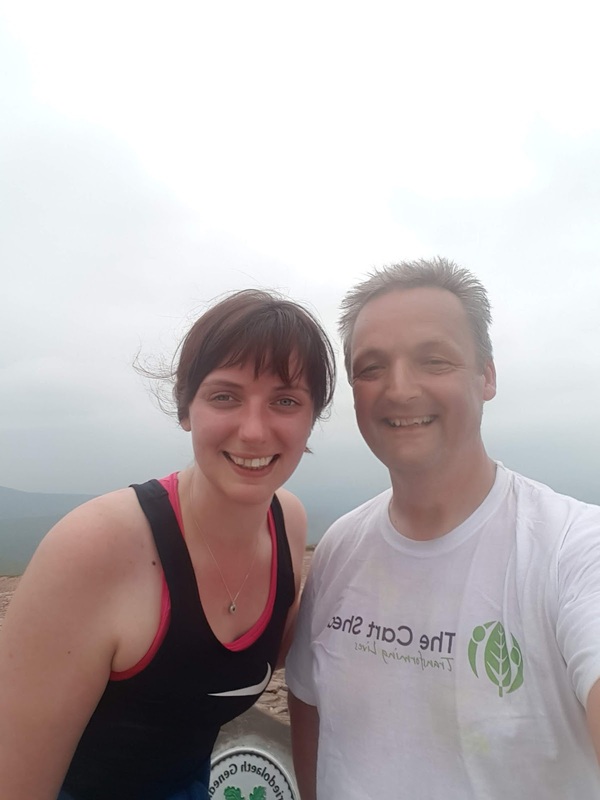 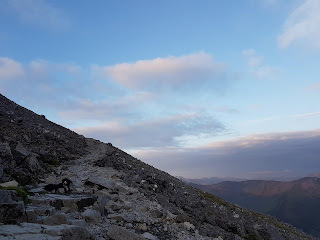 Skafell Pike however you spell it is a nasty mountain and it was not on the top of my things I would like to do today list, but it had to be done and with a sinking feeling caused by nothing other than fatigue yours truly got ready. 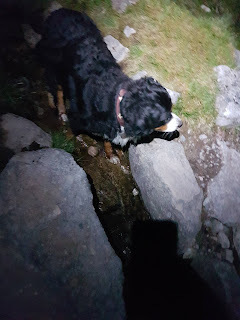 and had to be tethered to stop her chasing after us. 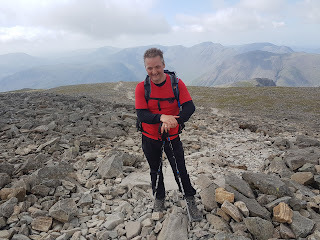 and even on the summit with good views 360 I still hated every step. 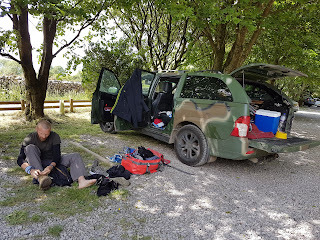 found ourselves back at the car park in 3 hours 31 minutes from the time we set out. 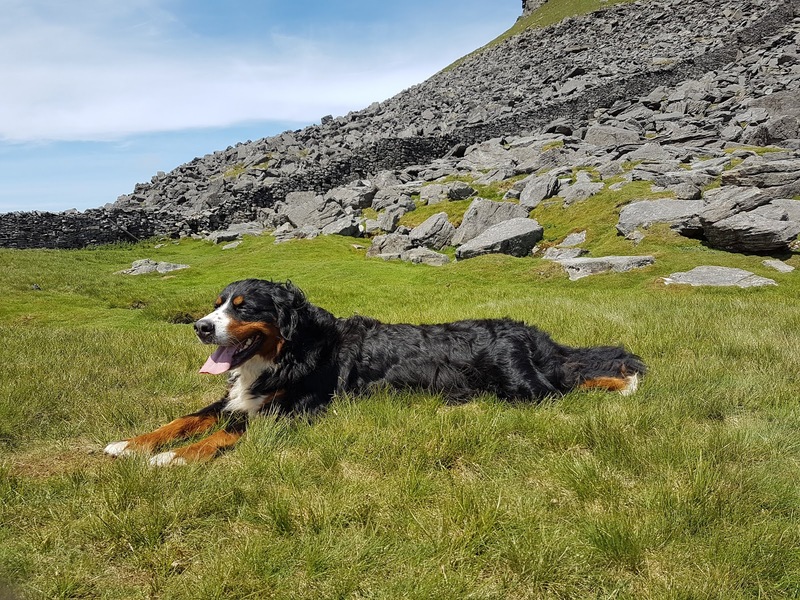 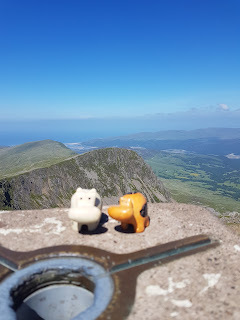 Now all we had to to was to bag Snowdon and 2/3 of the challenge would be over. passing the time with discussions of when would we sleep and for how long. 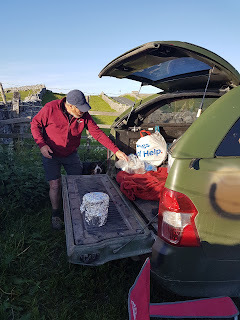 bagged and recorded and so we headed back to the car, again making the 7.5 mile trip in 3.5 hours. 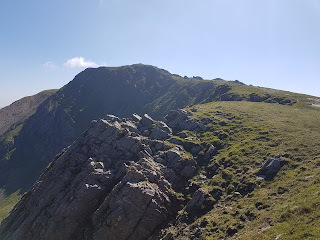 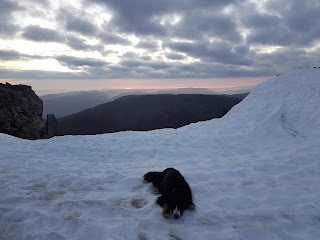 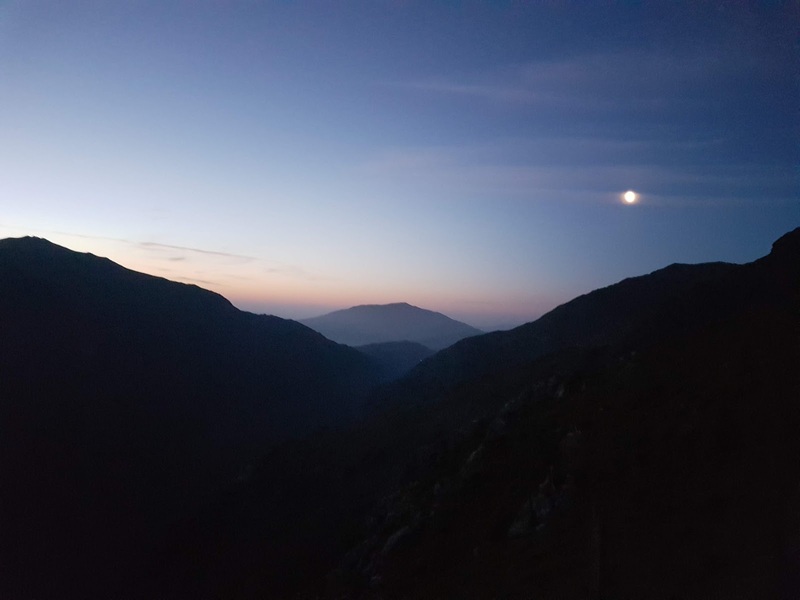 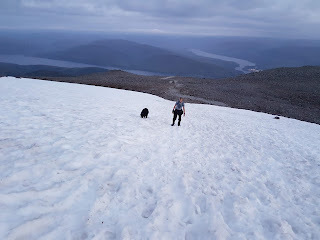 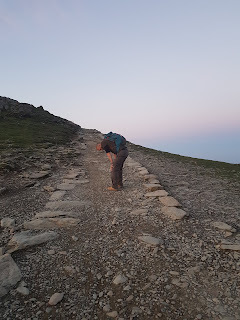 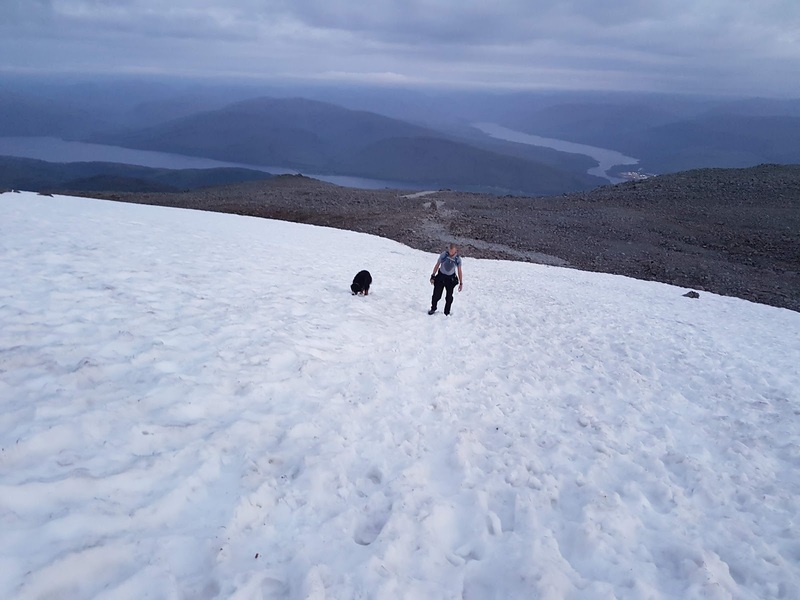 Having decided to forgo sleep and spend the whole night walking up and down the same mountain we downed a cup of tea the first version of which had yoghurt in instead of milk, tired anyone? 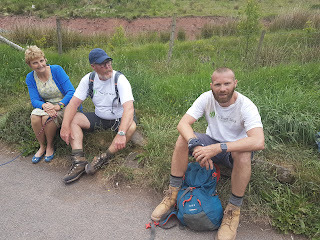 we were very happy, if not a bit tired. This oic has the moon on the summit, even when tired Im all over art me. 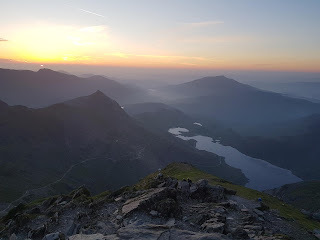 At the summit we met a group who we had first seen on Ben Nevis and then Skafell and pissed all over their chips by letting them know we were on our second ascent of Snowdon in response to their "Oh made it then" comment. 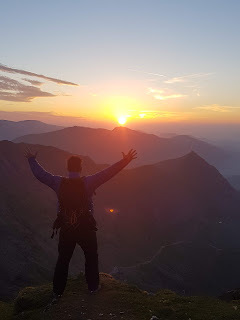 Alone on the summit we were treated to the most spectacular sunrise. so much so that you expected an orchestra to start any second. 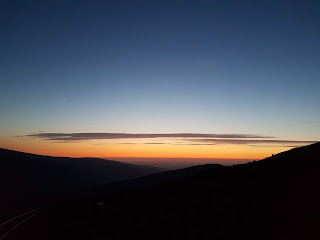 While we were beasting ourselves there were moments for quiet reflection, and it is a true statement to say that both Richard and I were moved by this sunrise, the experience and the sadness that Adam would never see it. 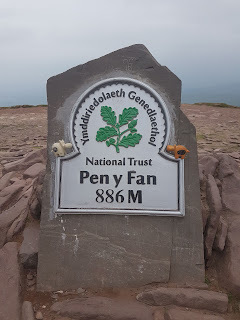 Which lets face it was a long way down. and yours truly forgetting to turn off the gps tracker until he had eaten his pouch of baked beans. 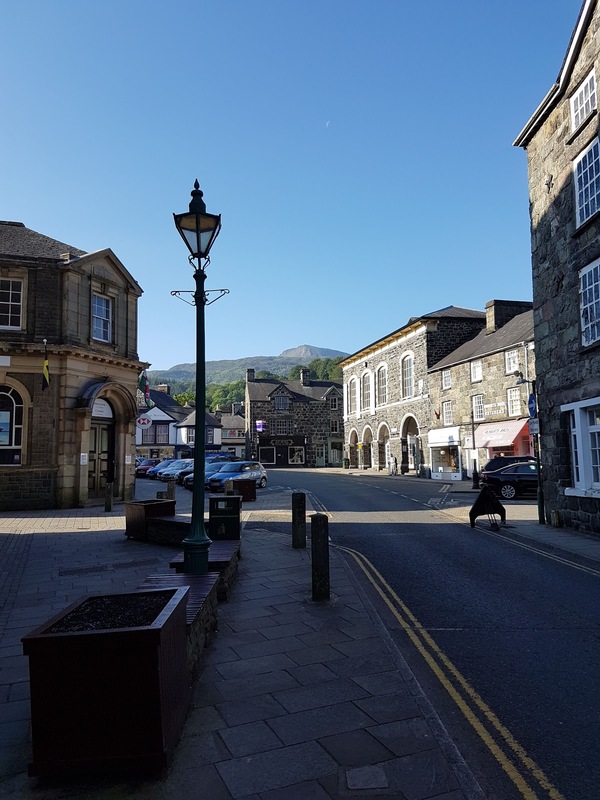 Stan took us to a lovely Welsh market town called Dogethlau or similar where Cadir Idris lurks above it. To us it was lunch time, to everyone else it was too early to open but we found a nice hotel called The Ship where we had this breakfast. 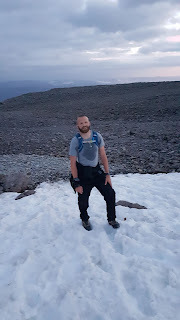 and as there was not cloud anywhere it was decided to ditch a lot of our gear and go super lightweight. 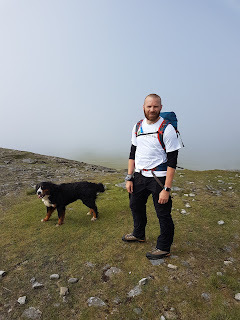 One of us looks dressed for it, the other like his carer. 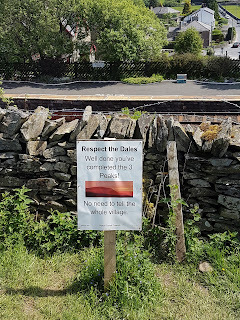 an d heartily sick of orange squash. Eric and Ernie posed and then we set off hot foot, literally, back to base camp. 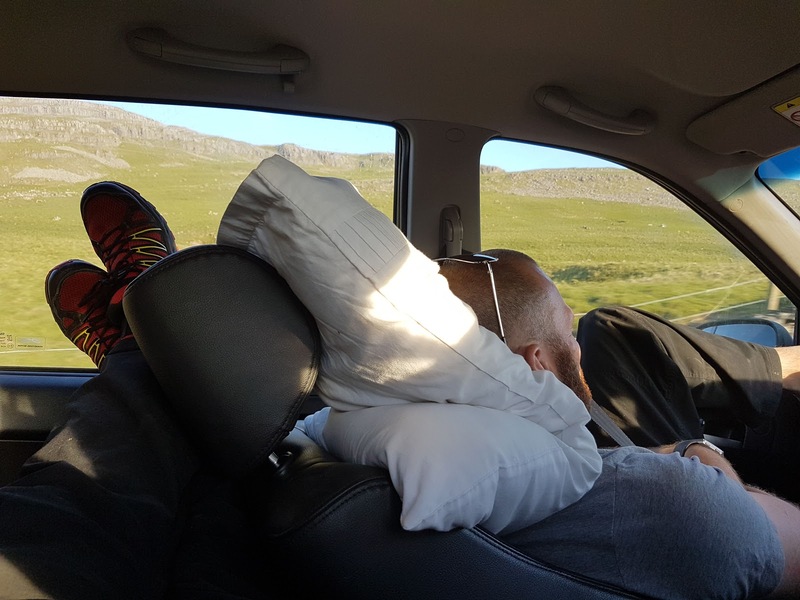 Where Richard adopted his standard pose in the back while I played nodding dog in the passenger seat. 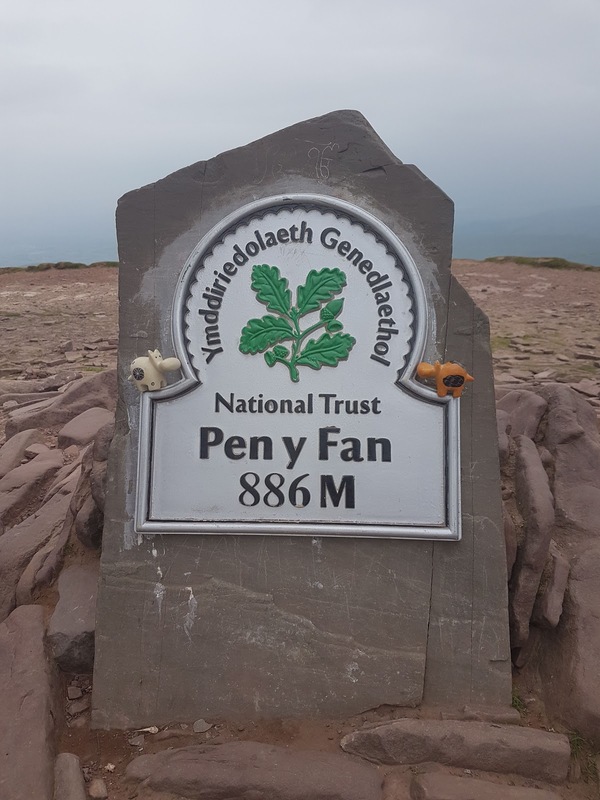 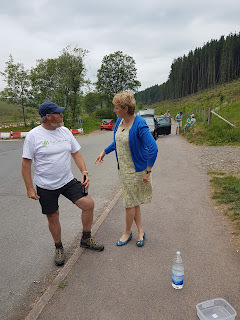 At the base of Pen Y Fan we met Caroline who had conquered Kilimanjaro with us last January. getting to the top in under 1 hour. 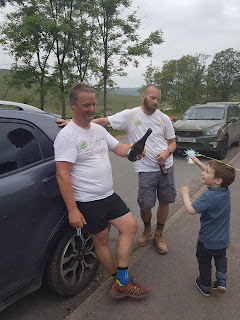 I turned the corner after crossing the footbridge and began the sprint finish to wonder why a small child in a yellow t shirt should be waving so enthusiastically at me only to find my beautiful and oh so patient wife and our two boys as a reception committee. They were treated to seeing yours truly cross the finish line first and claim a beer as a prize. 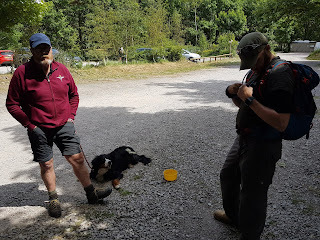 It was all very exciting and we even had champers to spray about. 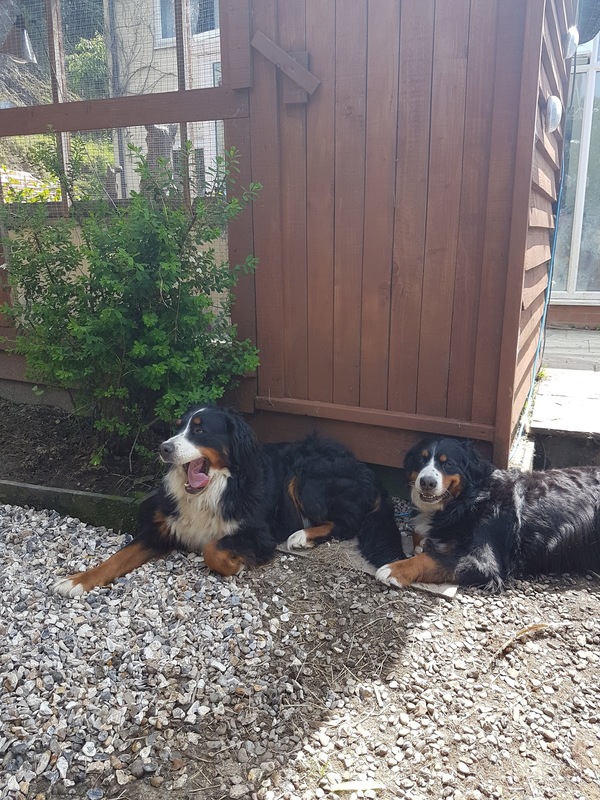 All the money goes to them. 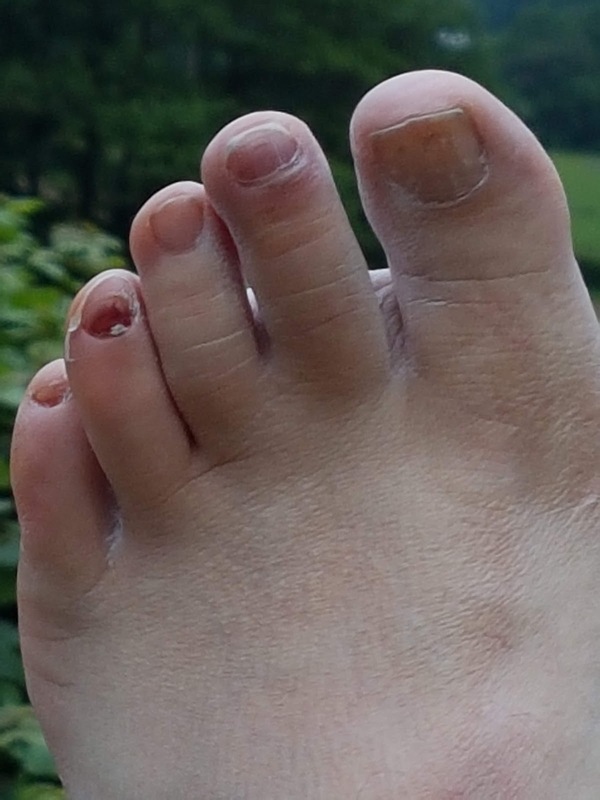 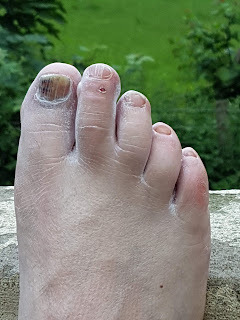 a few blisters and 4 toenails missing. 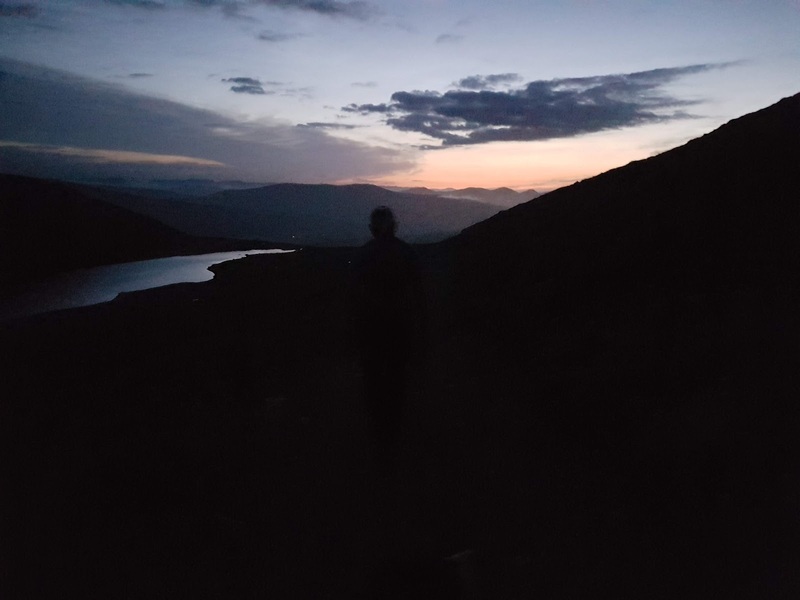 But is was worth it. 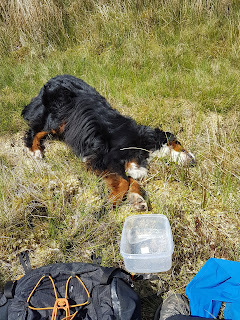 Mrs Bear was fine 48 hours after. 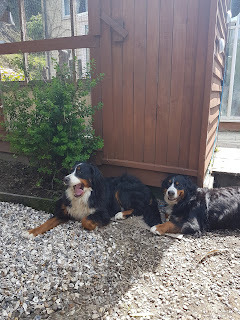 A true action Berner now!